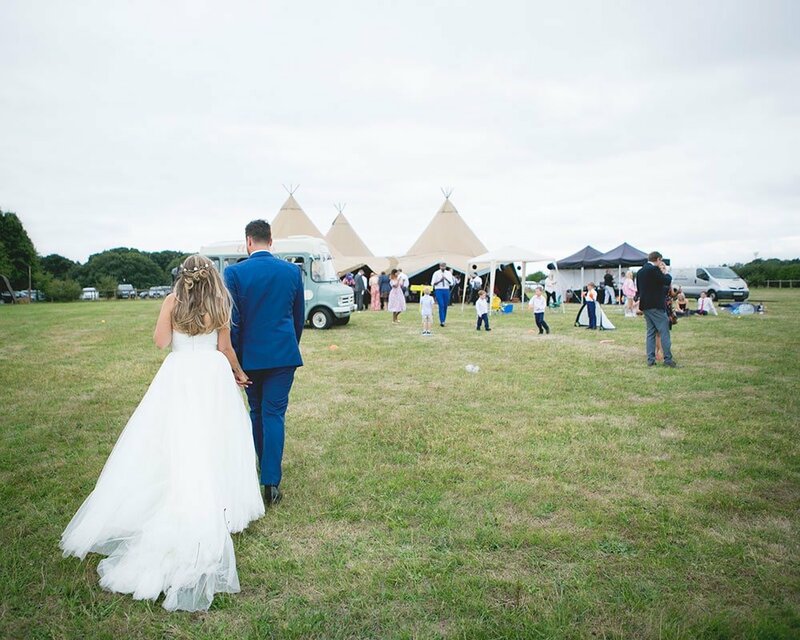 I had been longing to photograph a boho festival wedding for a while, so when Josh & Keziah got in touch and told me all about their wedding plans I was excited. 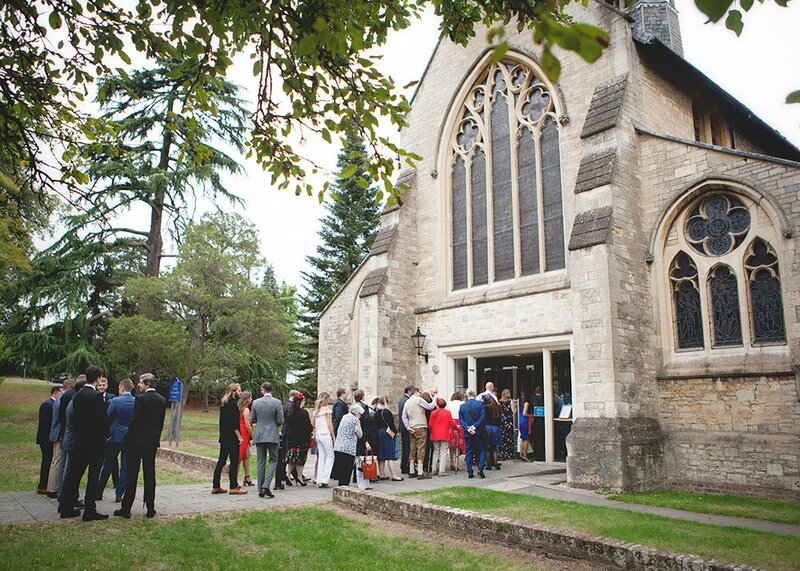 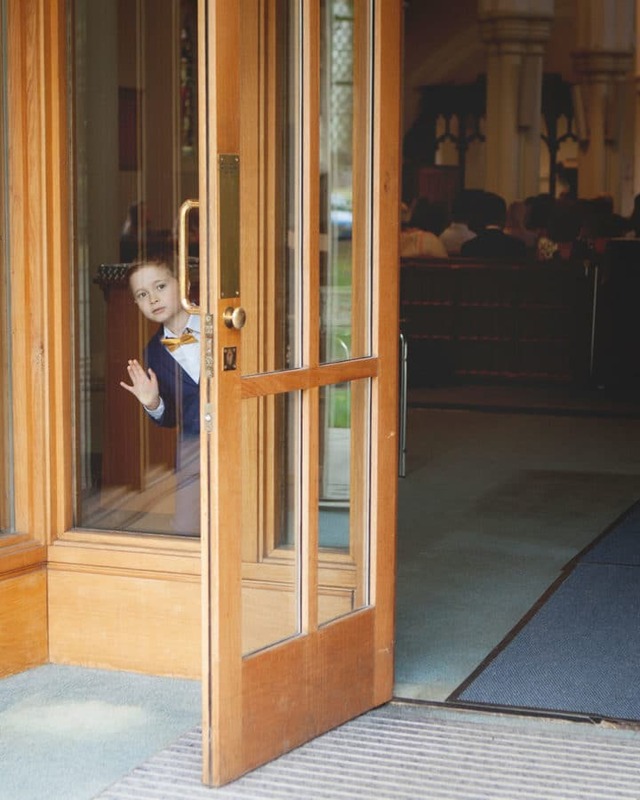 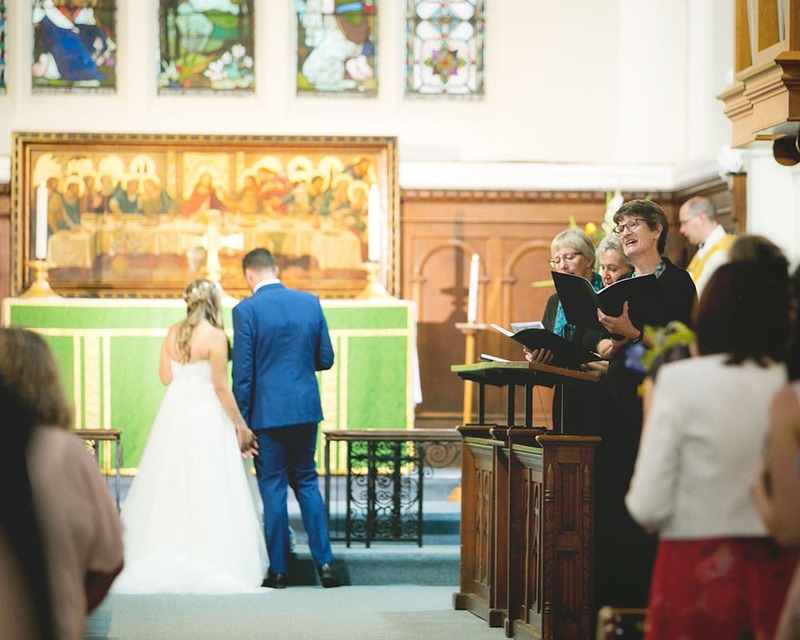 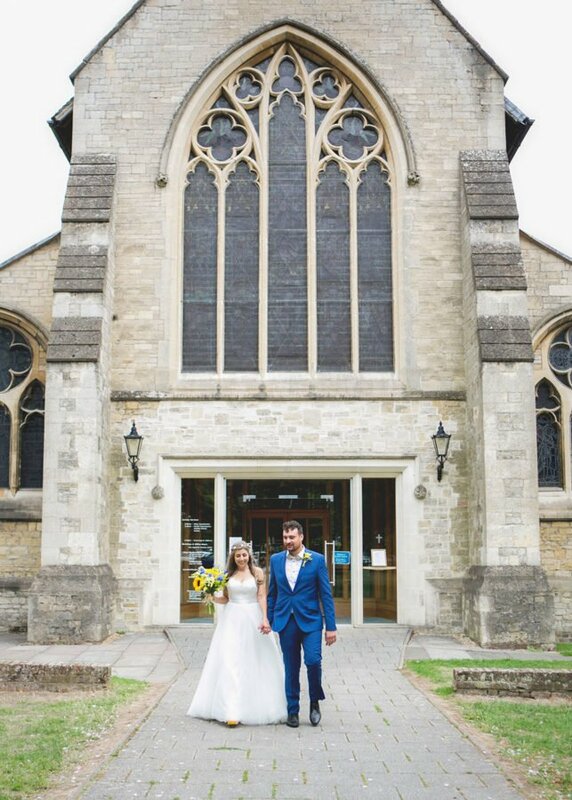 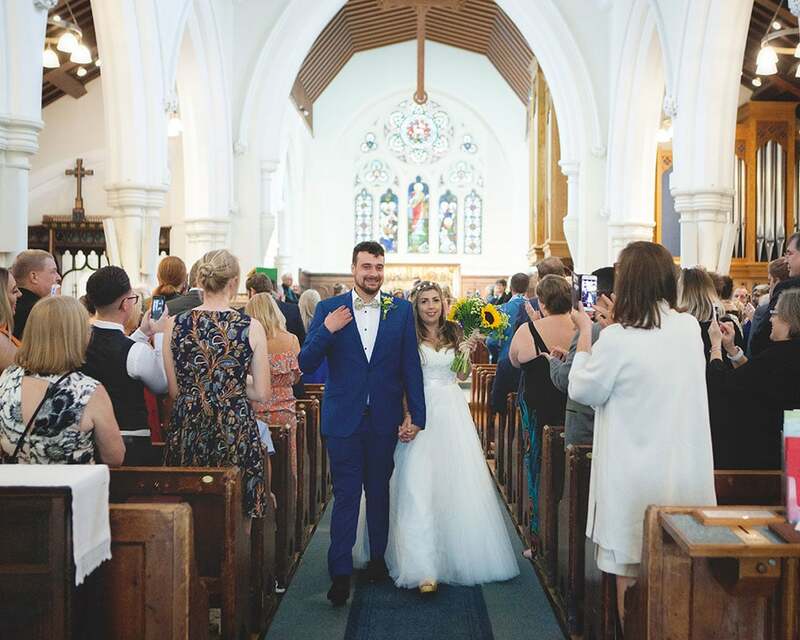 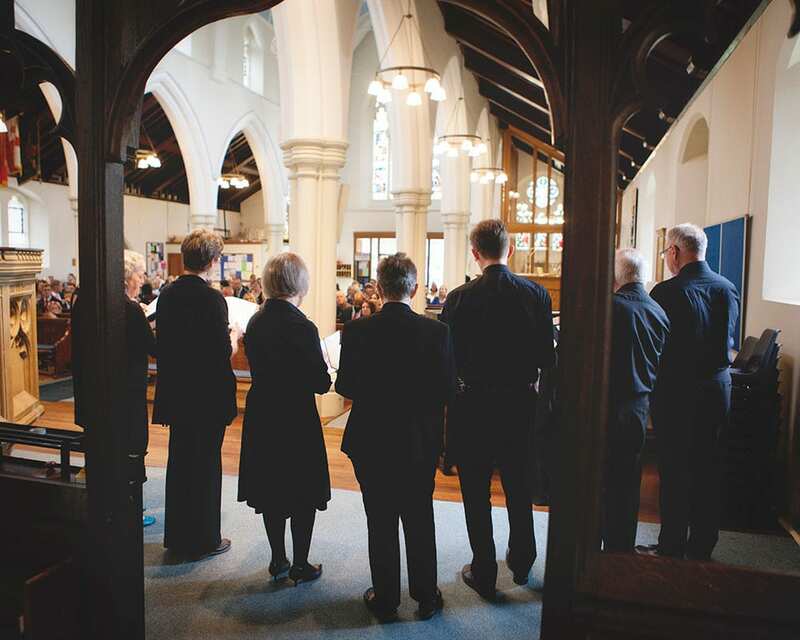 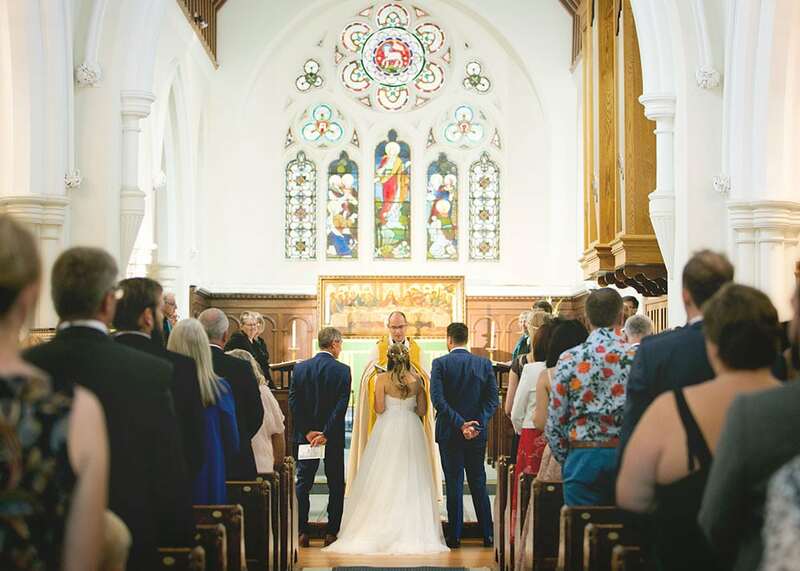 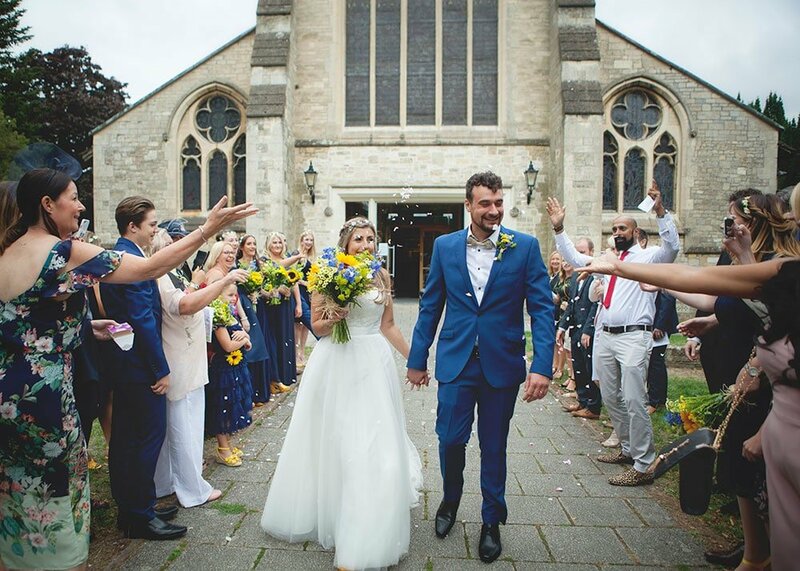 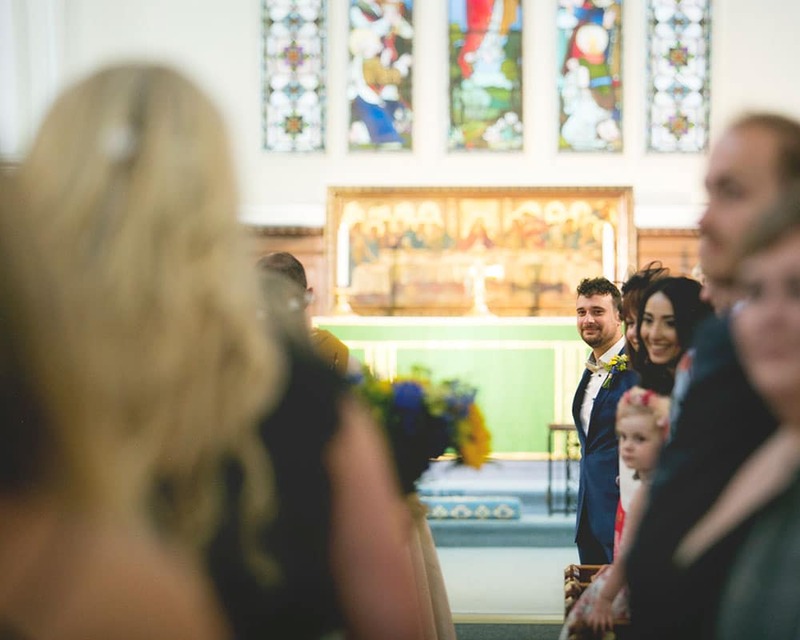 They got married at the beautiful St Johns Church in Hemel Hempstead with 170 of their nearest and dearest. 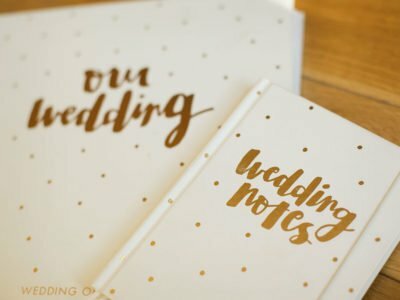 This is a great choice for couples having a large wedding. 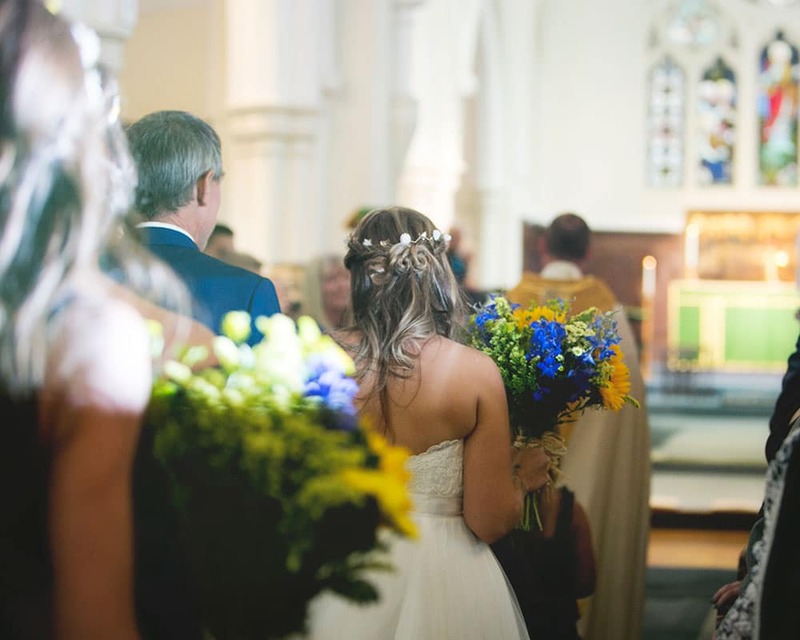 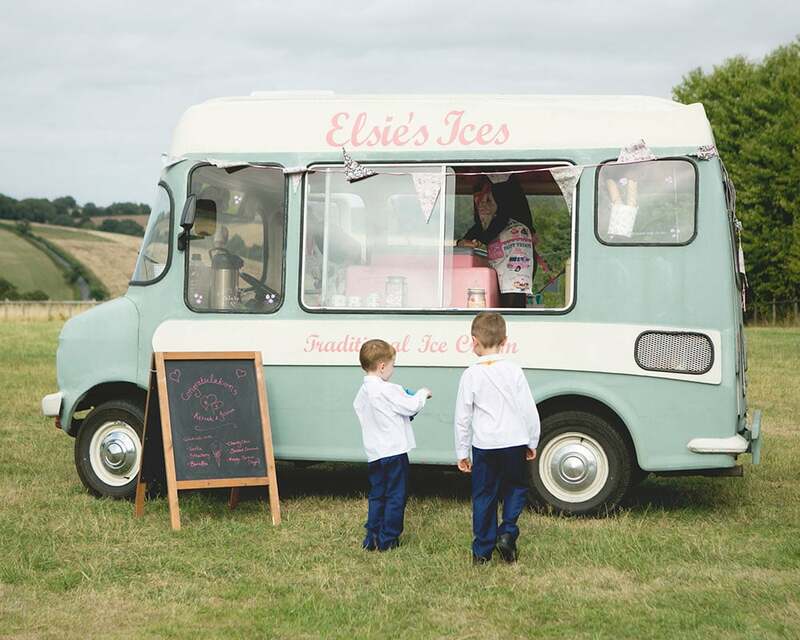 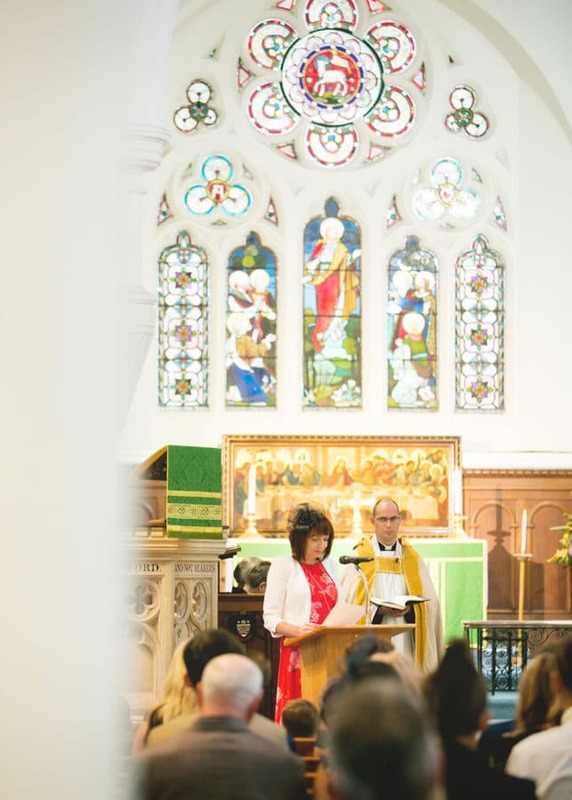 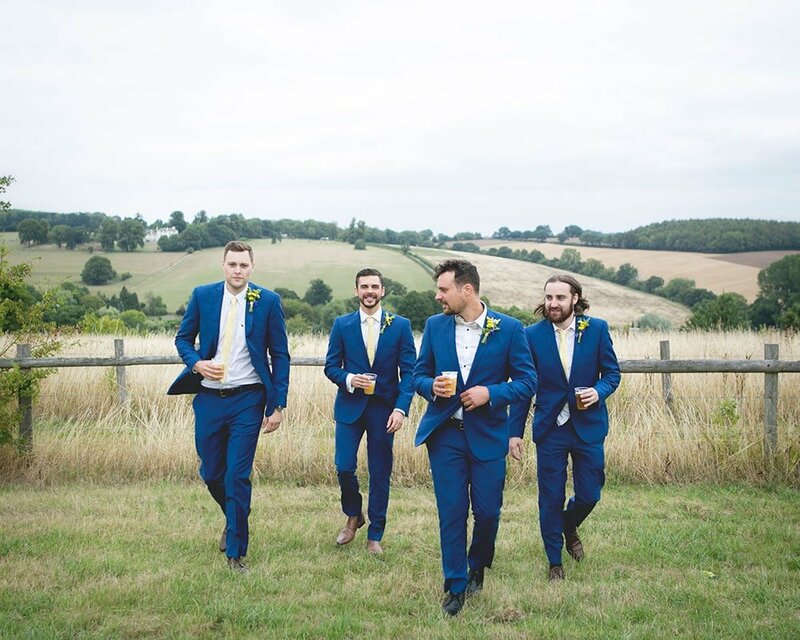 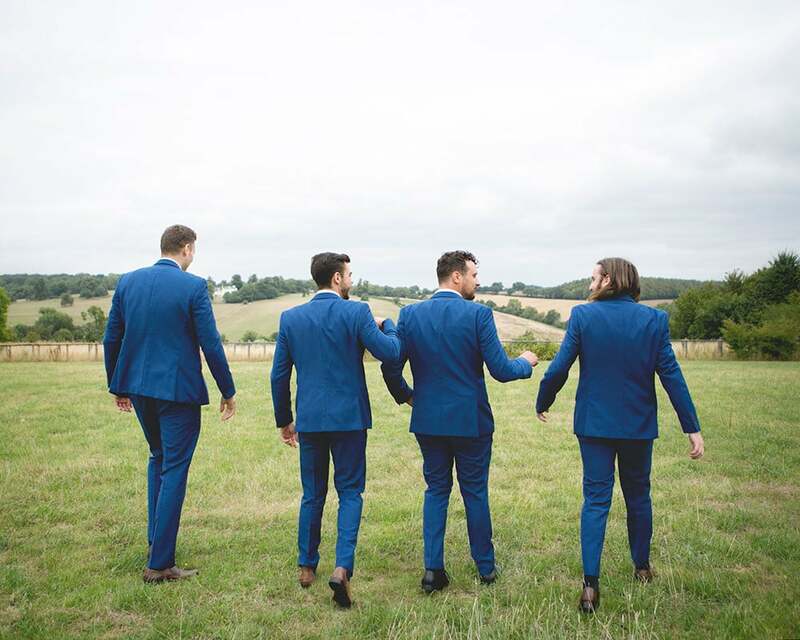 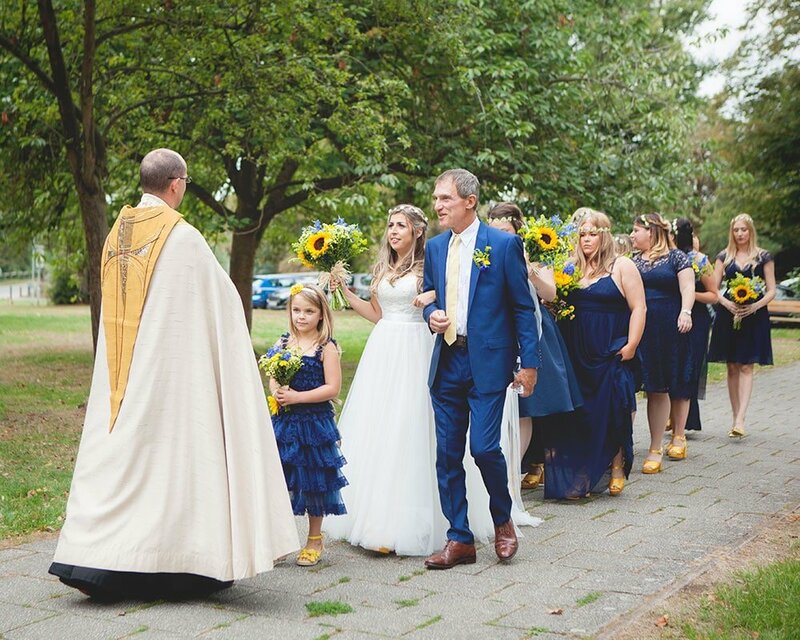 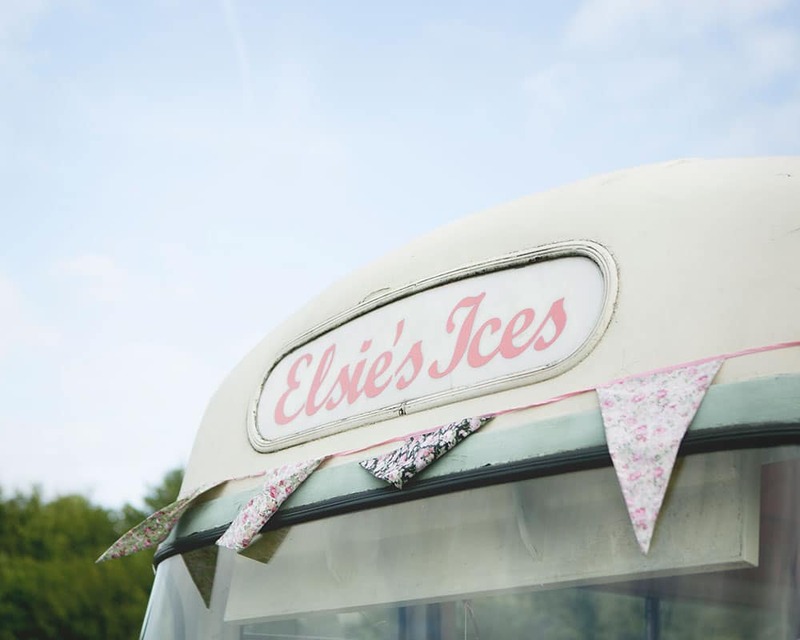 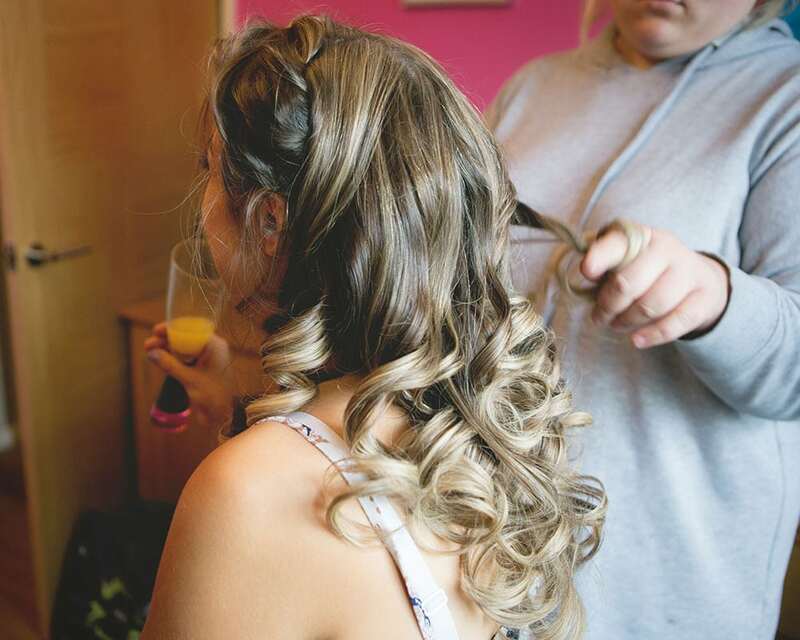 The wedding took place in August last year and Keziah picked colours that were perfect for a summer wedding. 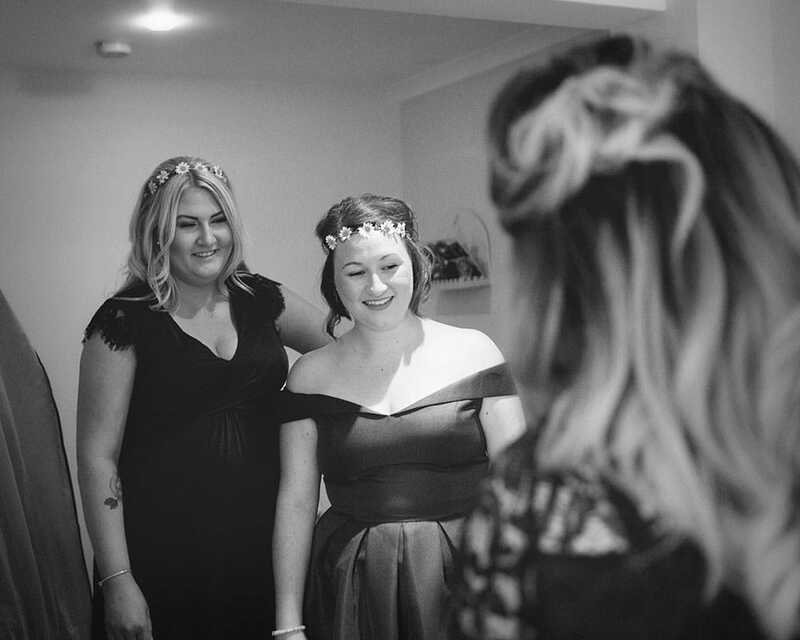 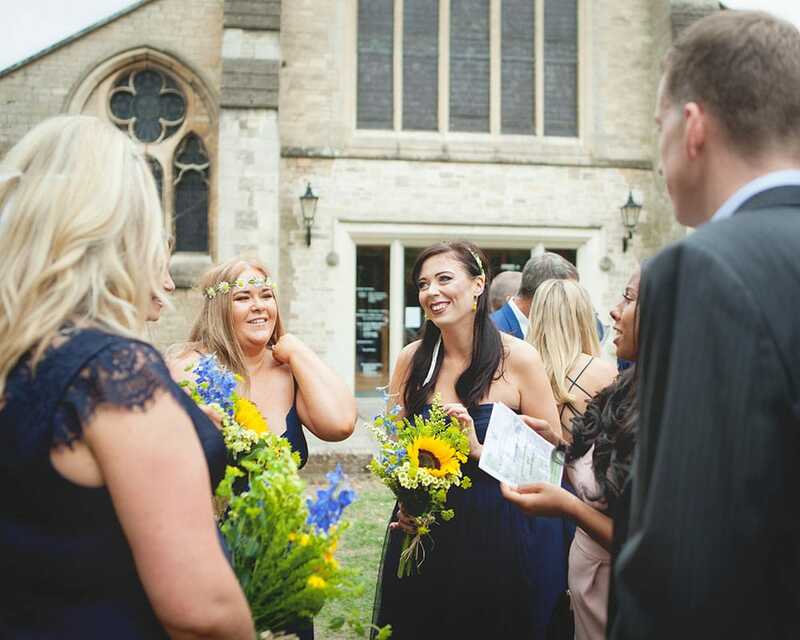 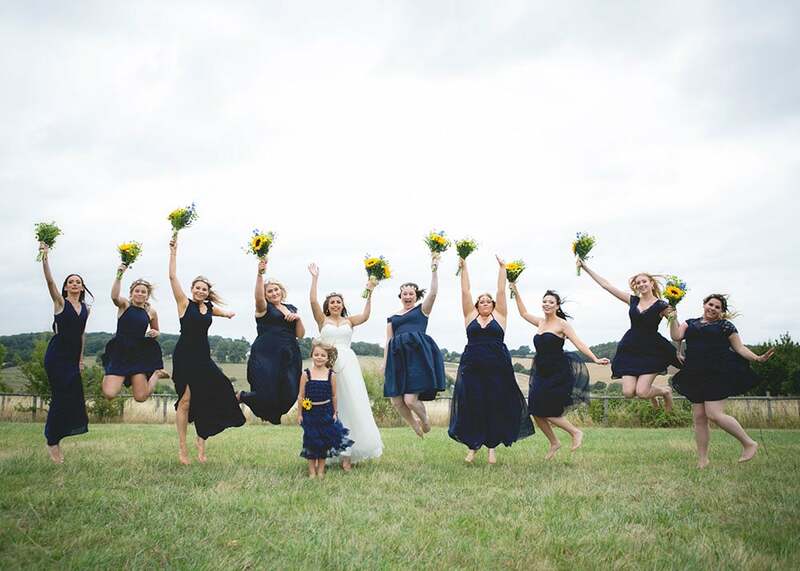 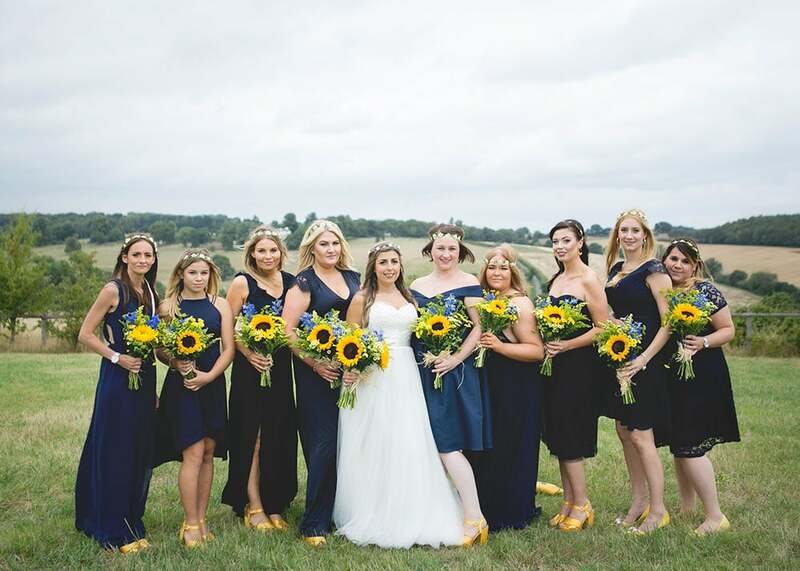 The bridesmaids wore rich navy blue dresses with bright yellow heels and Keziah matched them by wearing the same shoes under her dress. 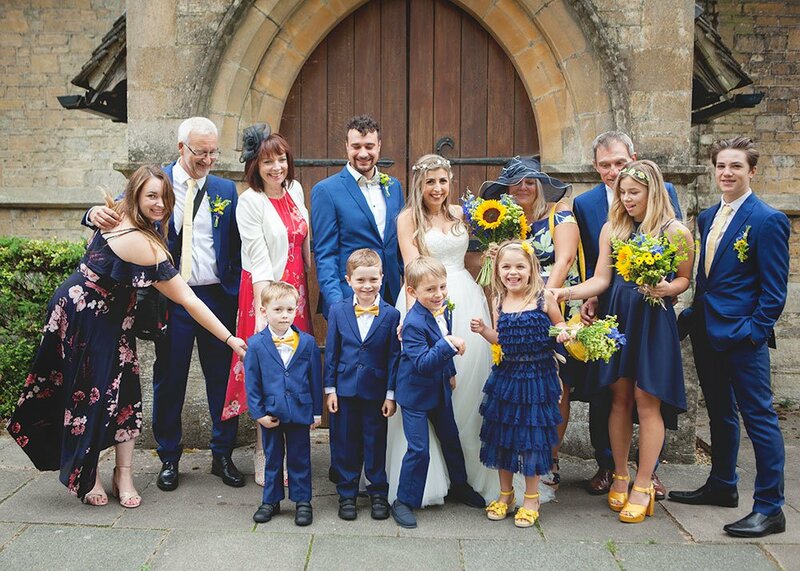 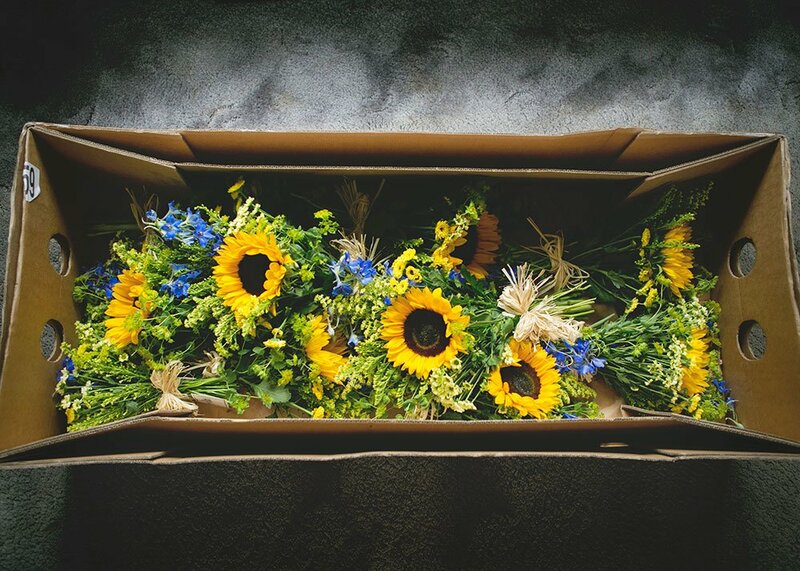 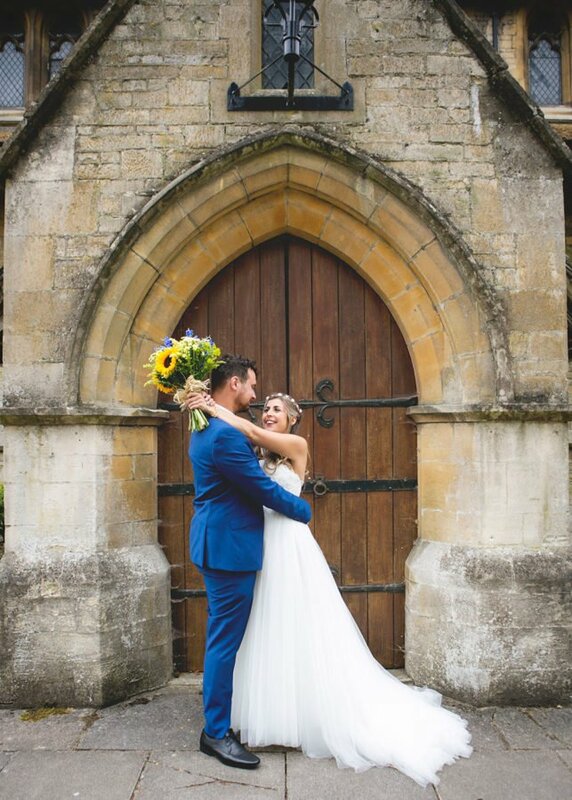 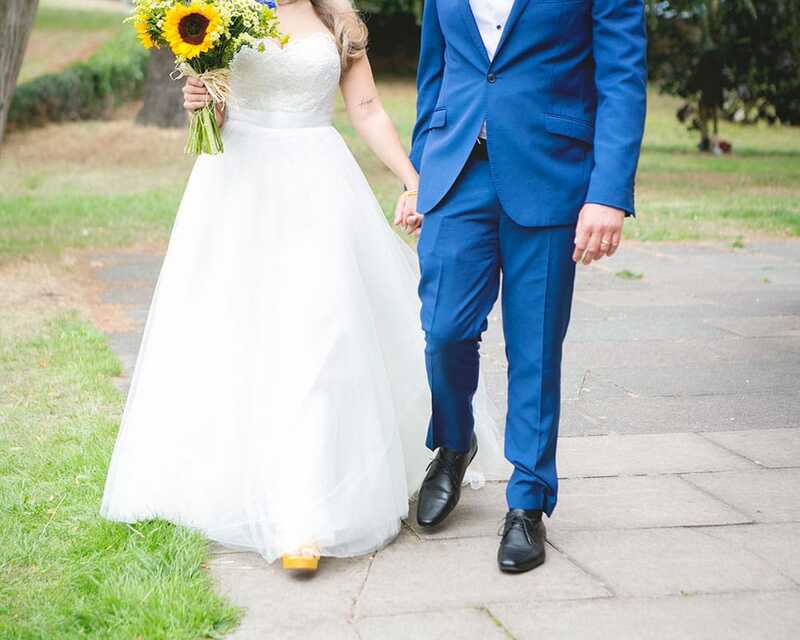 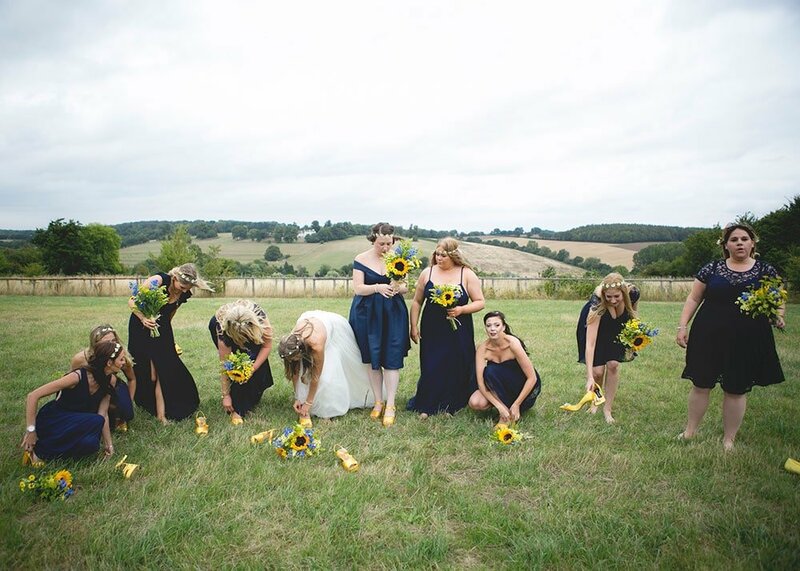 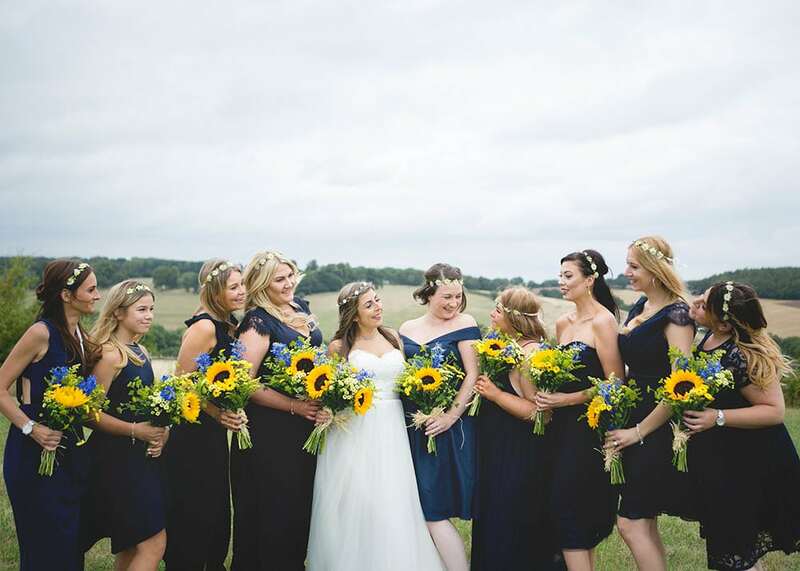 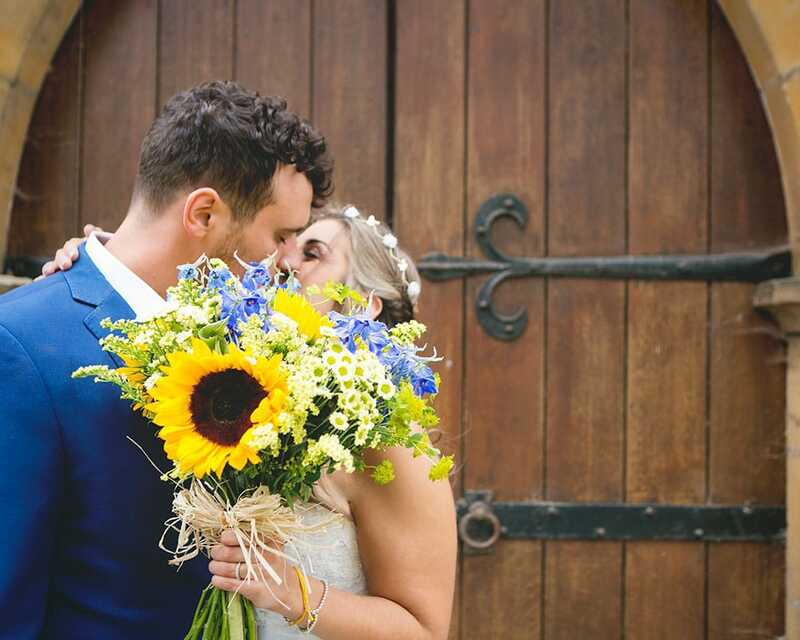 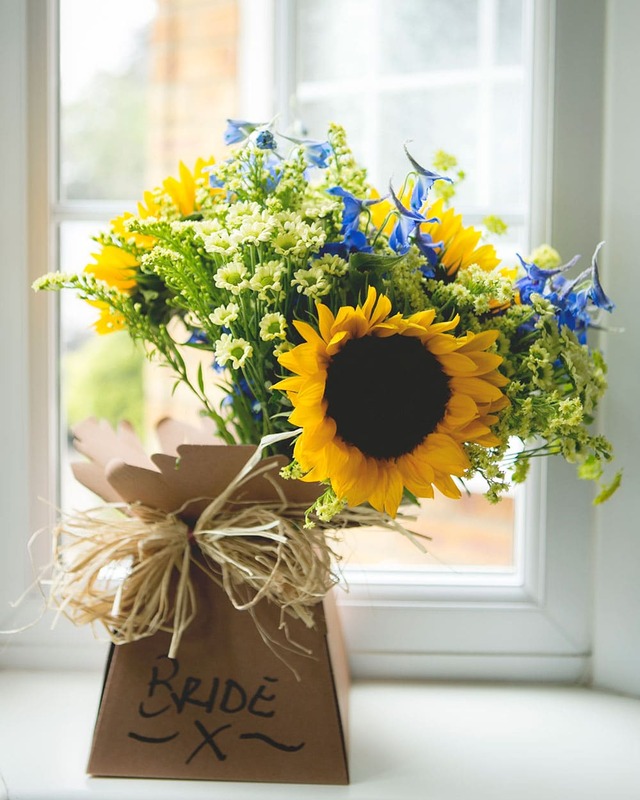 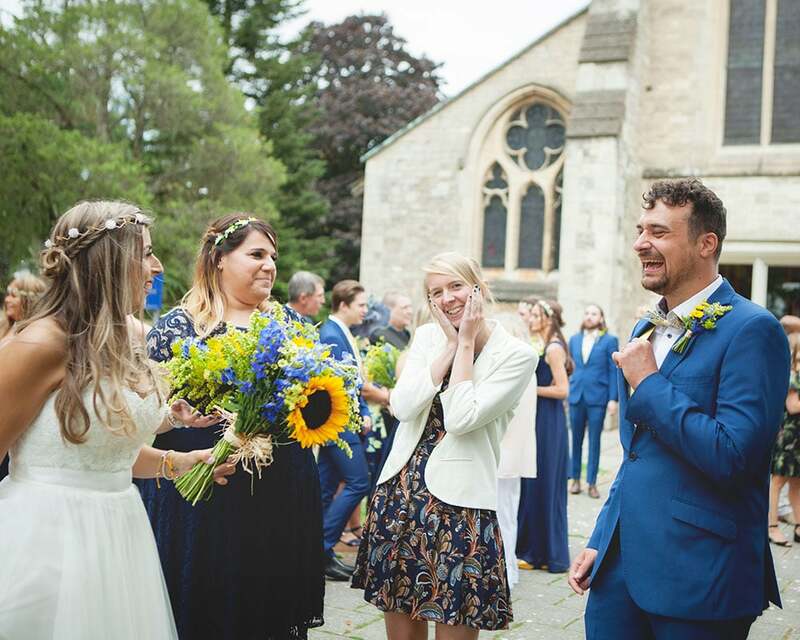 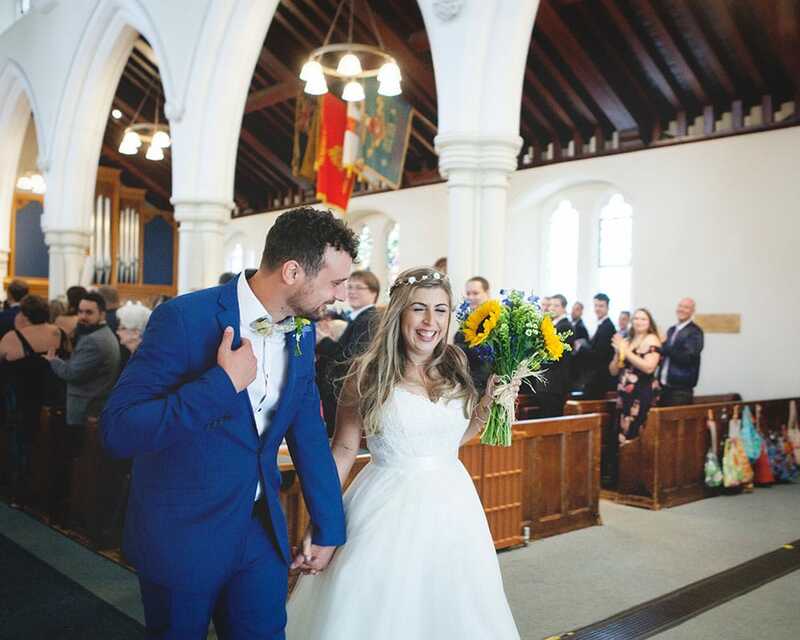 This bold colour theme followed through into the flowers with the firm wedding favourite… the sunflower! 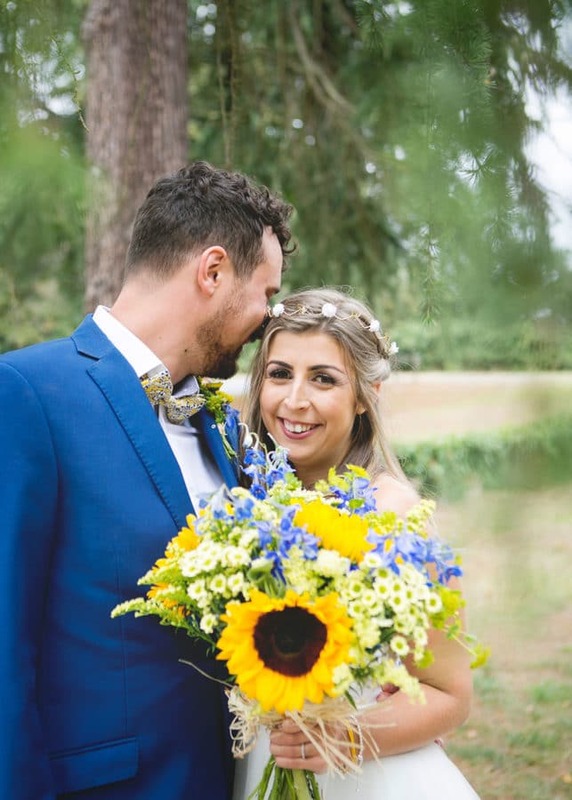 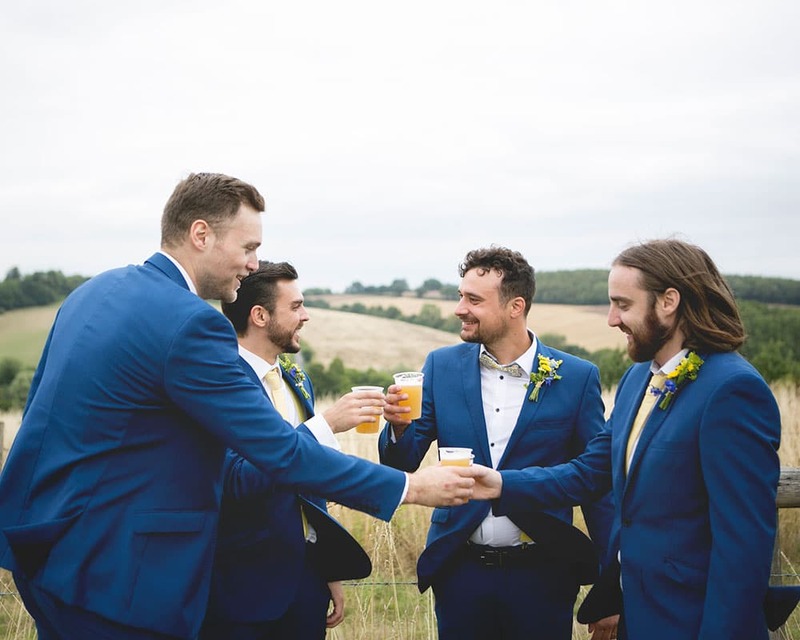 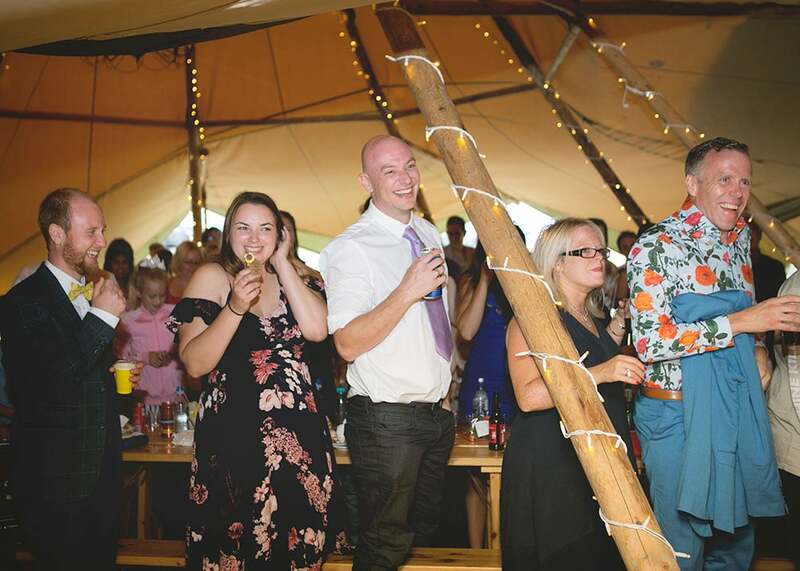 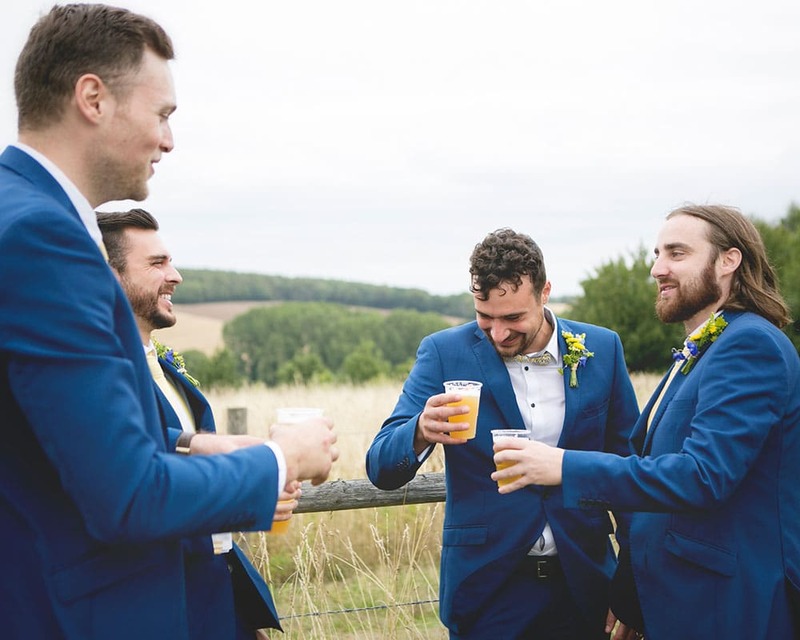 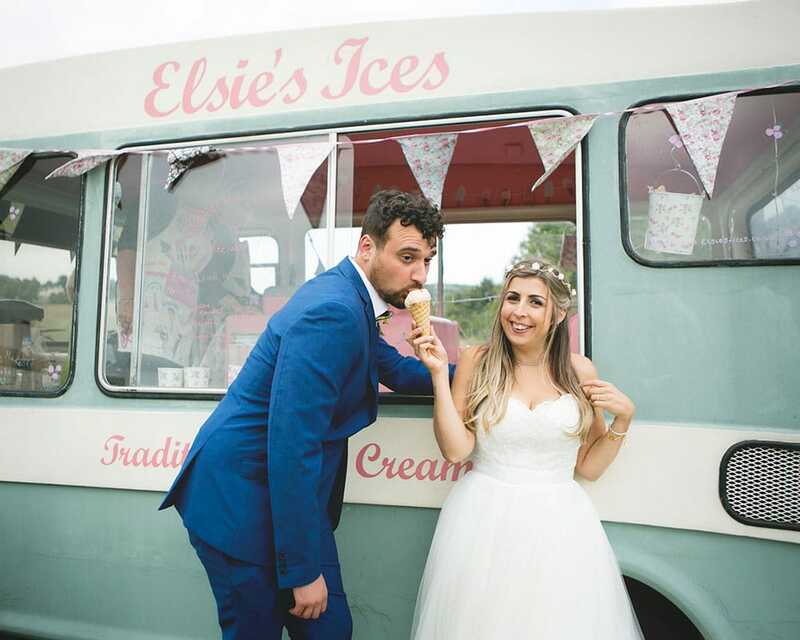 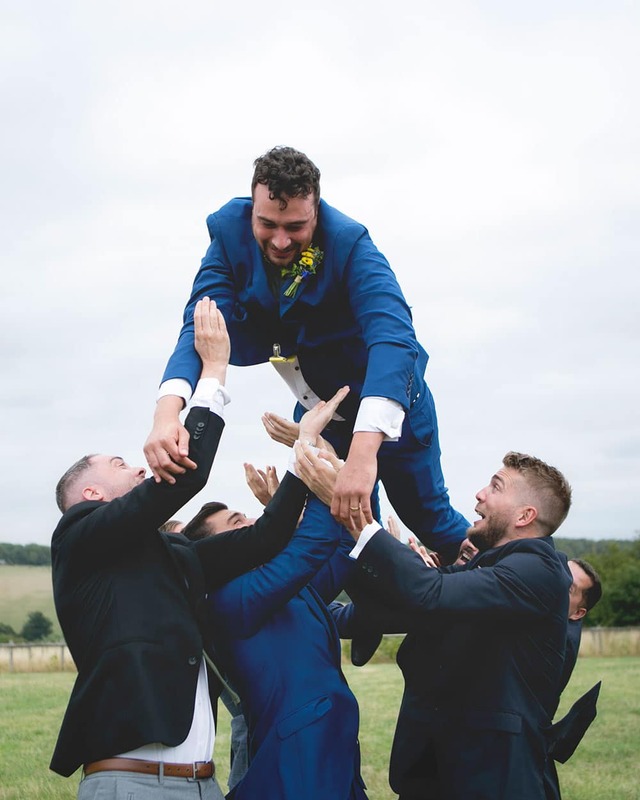 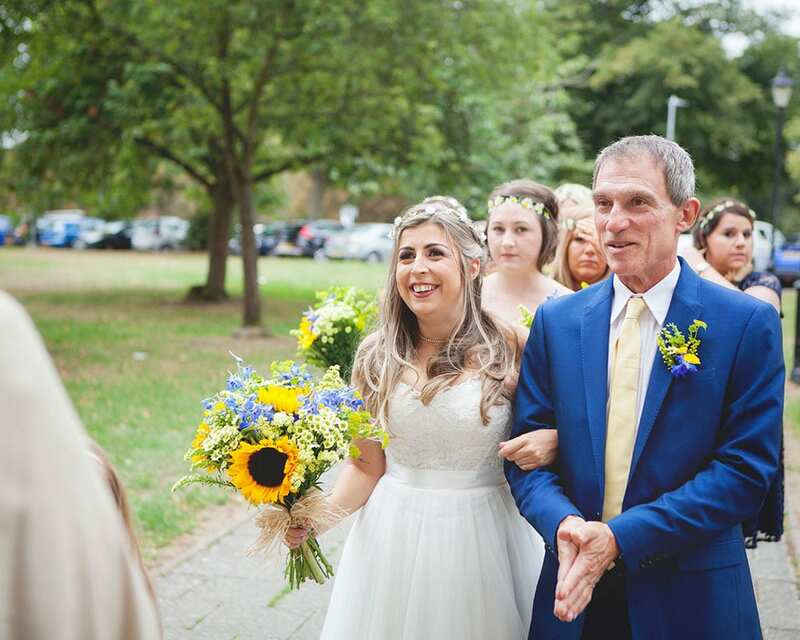 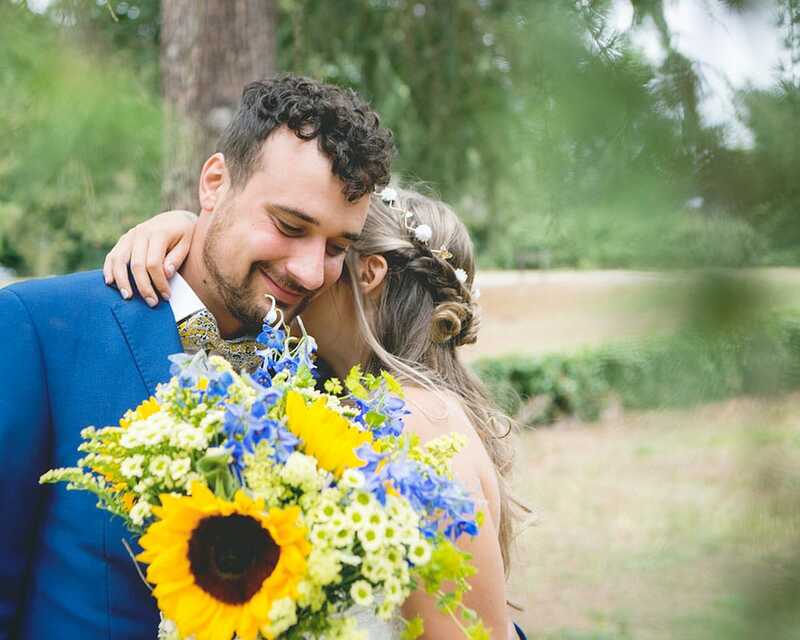 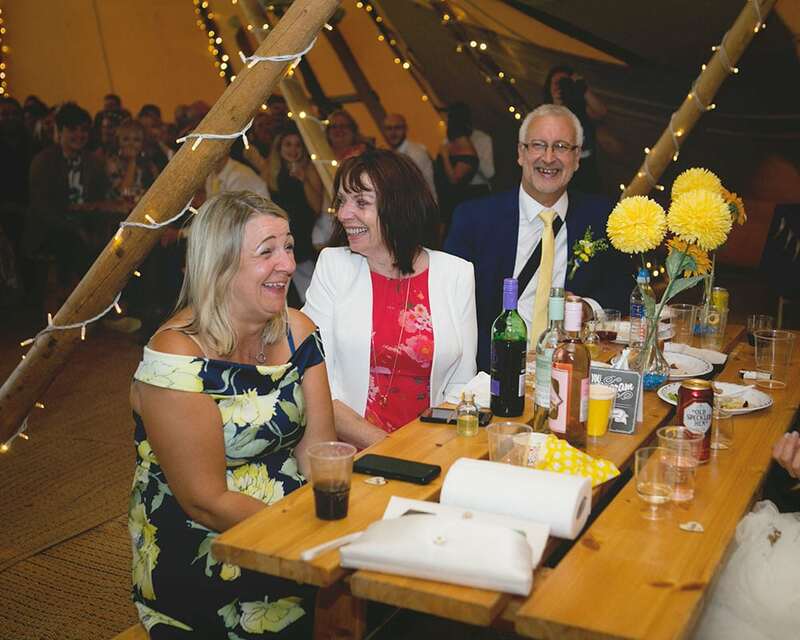 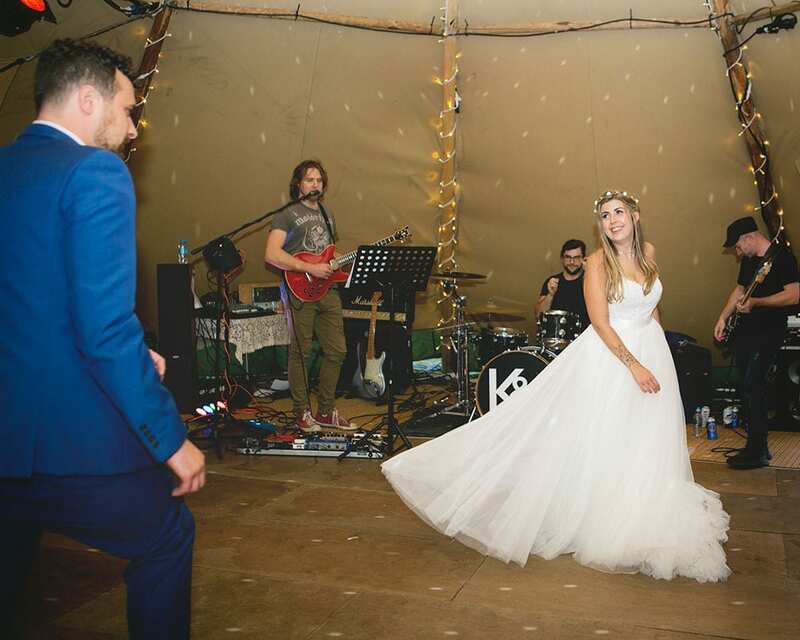 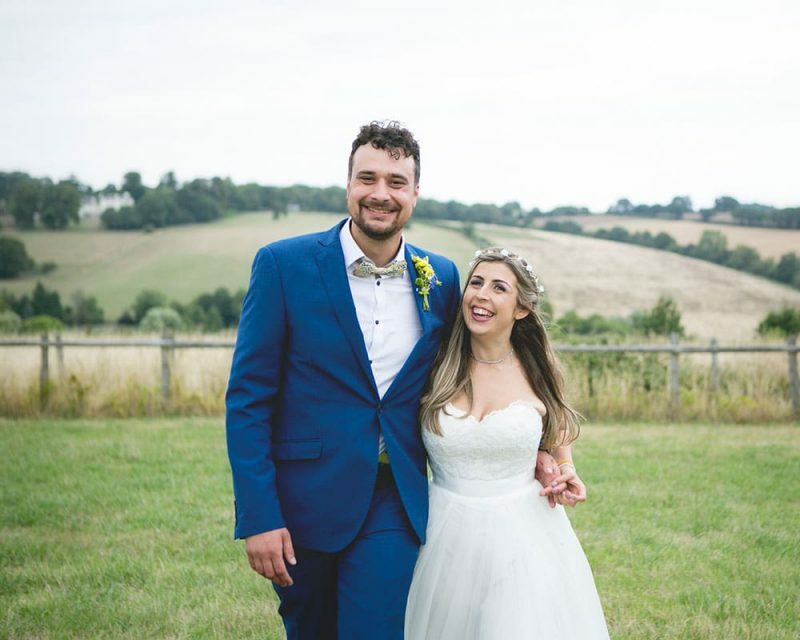 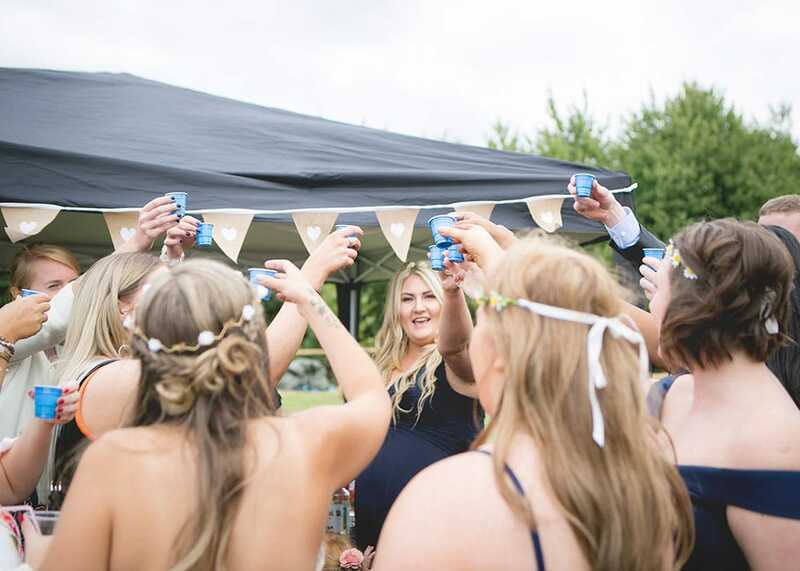 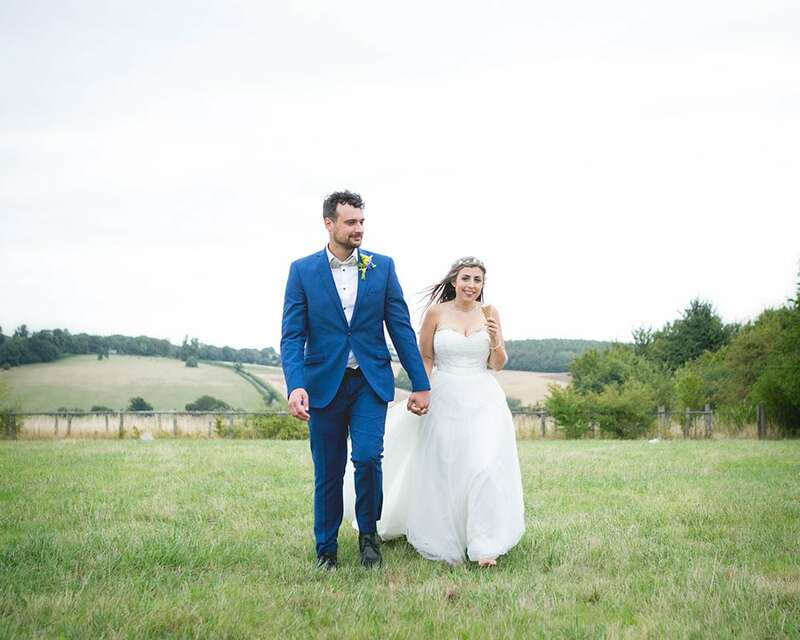 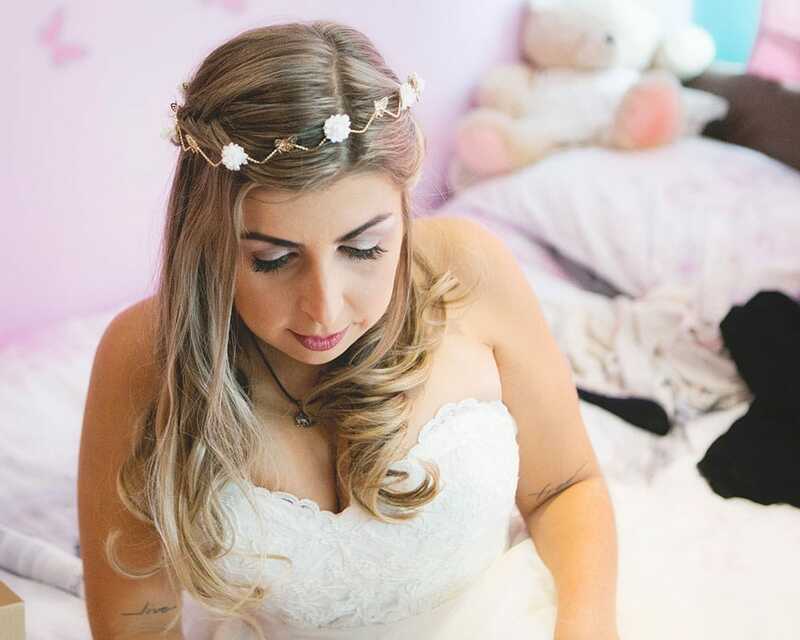 Josh & Keziah are a really relaxed and fun loving couple, so their boho festival wedding reception was the perfect way for them to celebrate after the official ceremony. 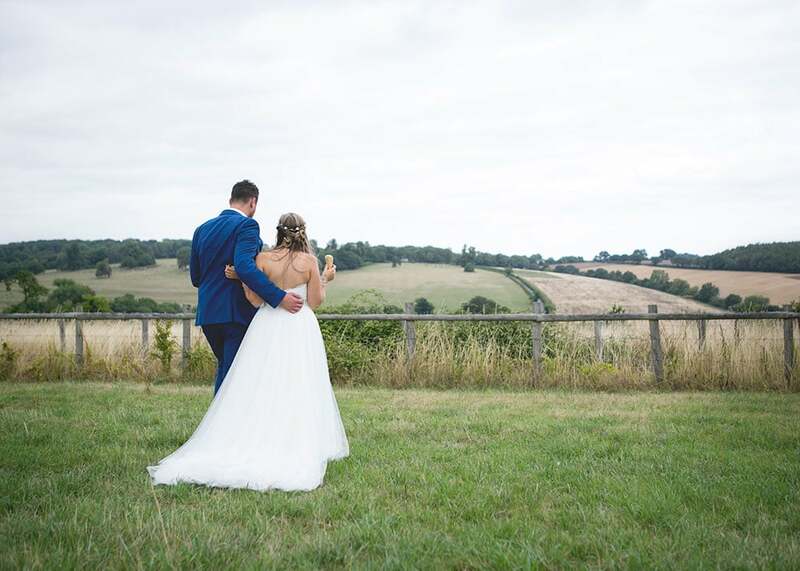 All 170 guests travelled from Hemel Hempstead to one of my favourite Hertfordshire wedding venues, North Hill Farm in Chorleywood. 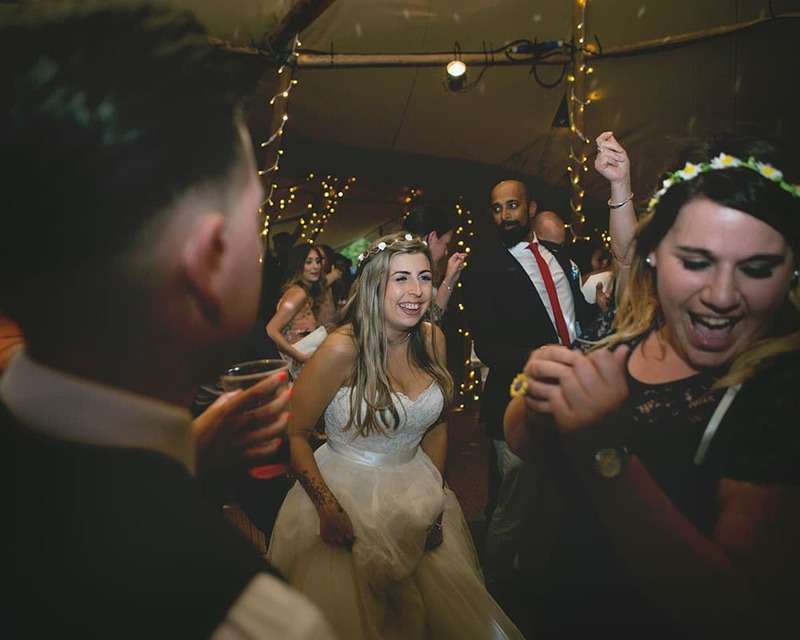 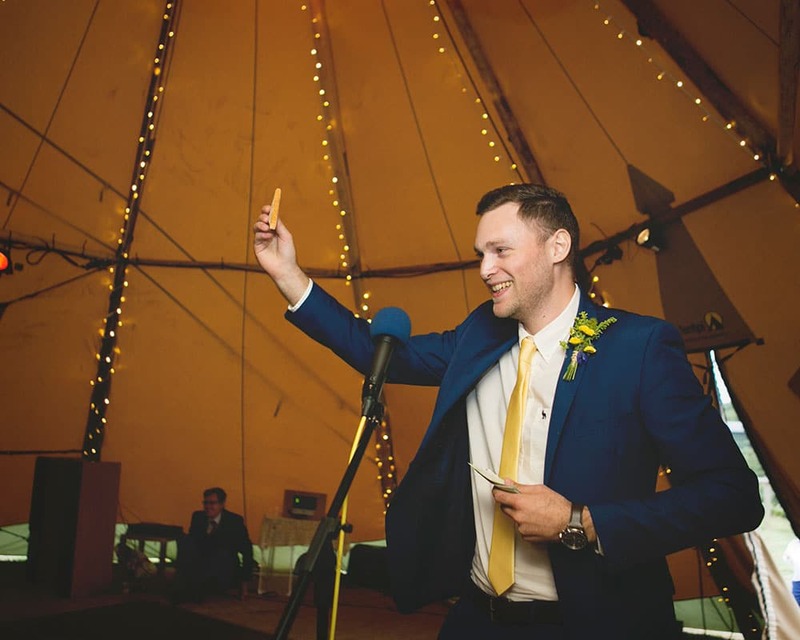 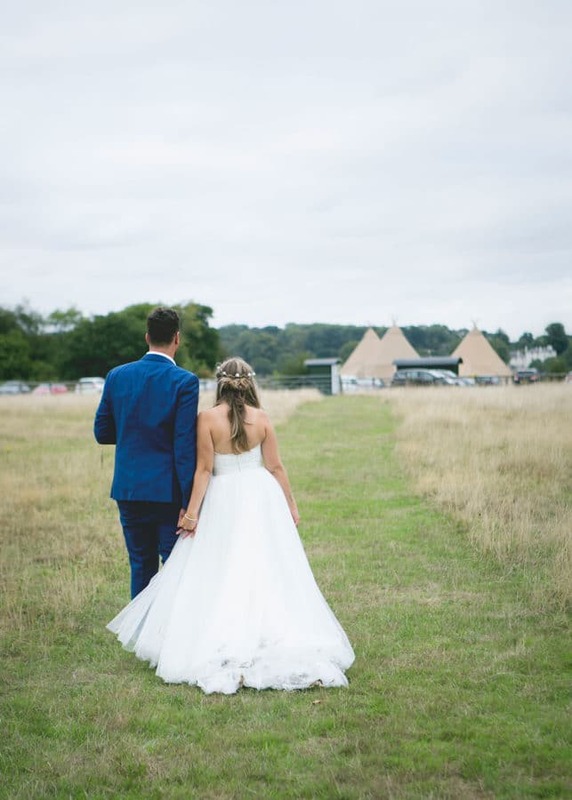 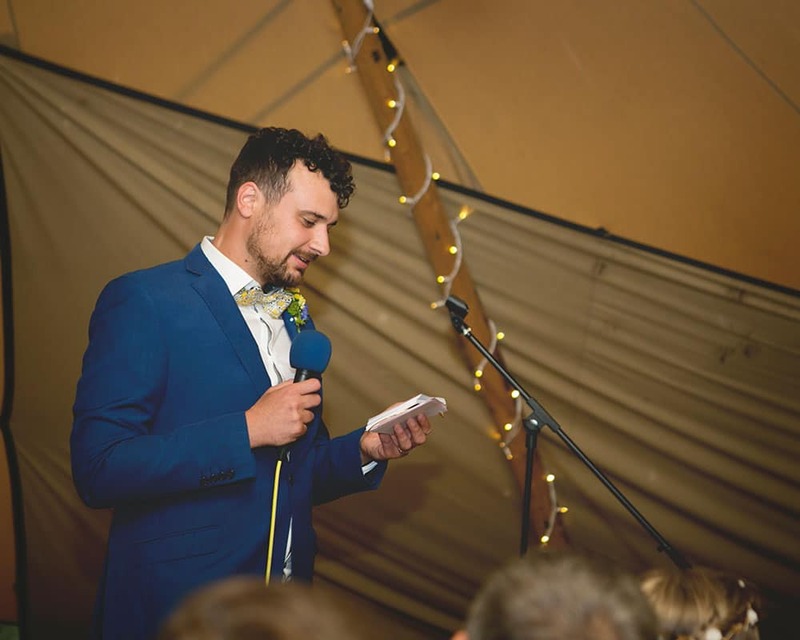 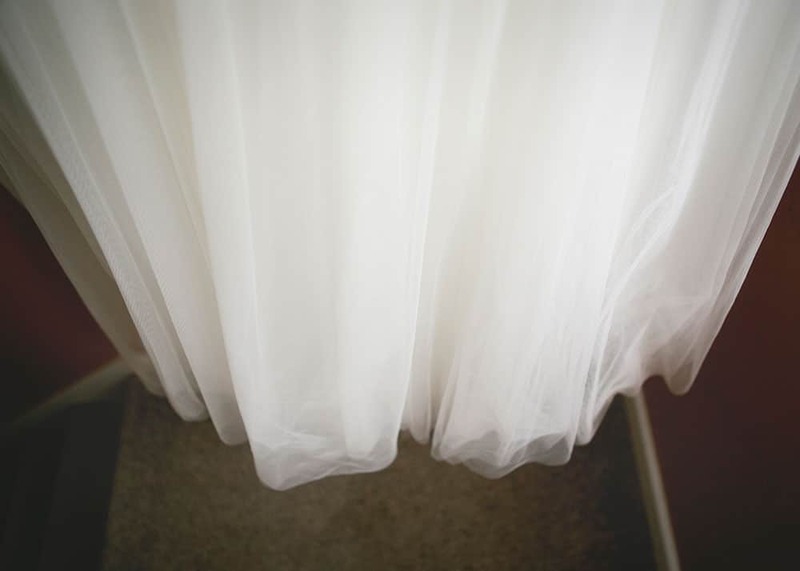 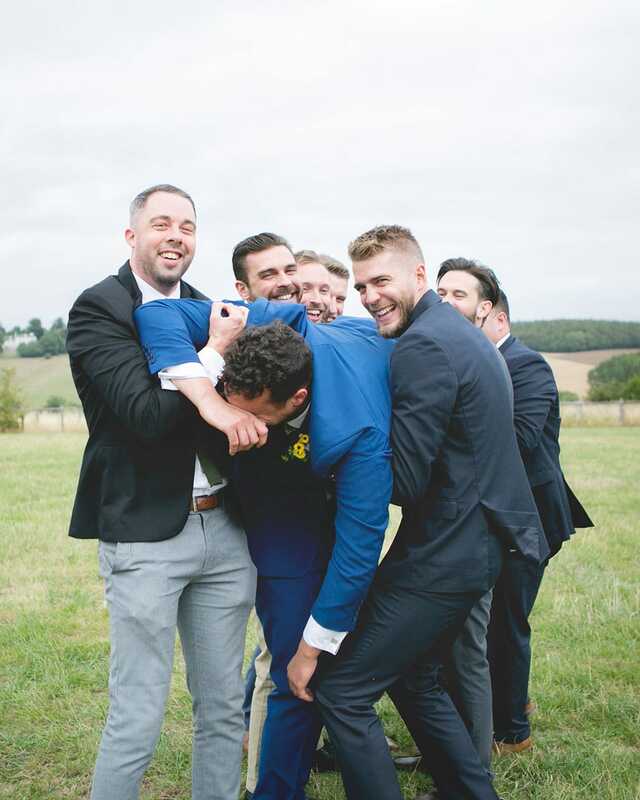 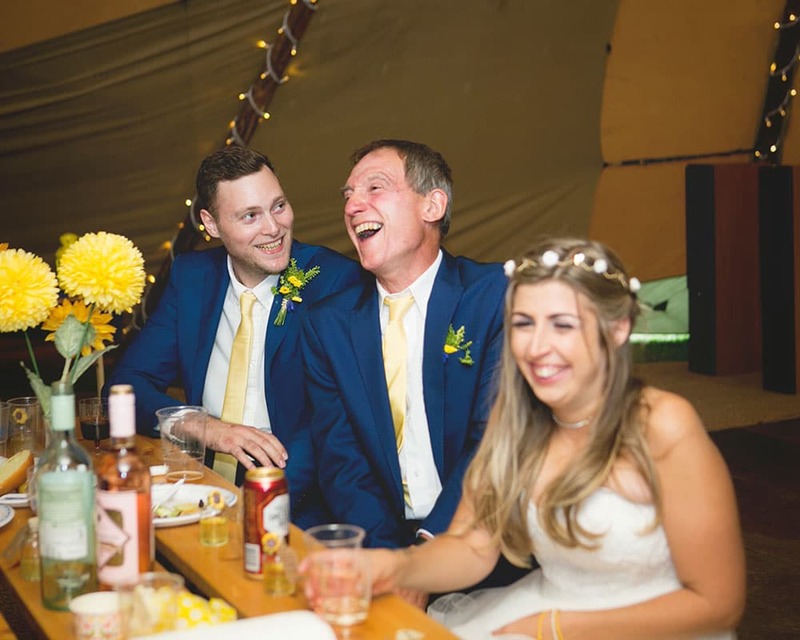 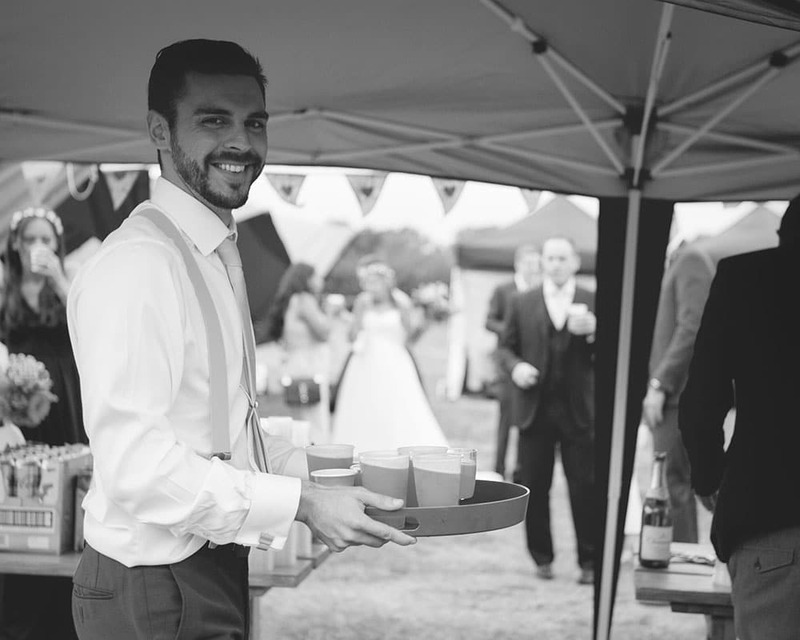 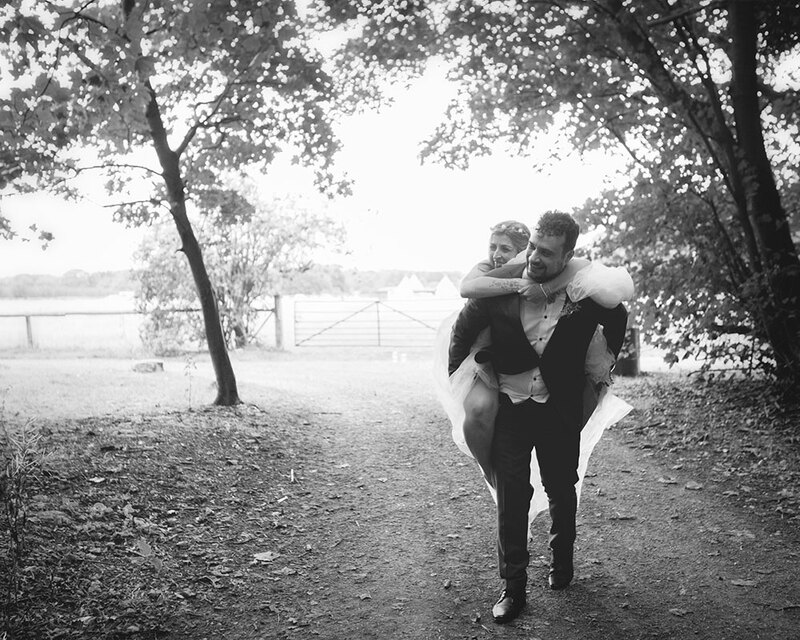 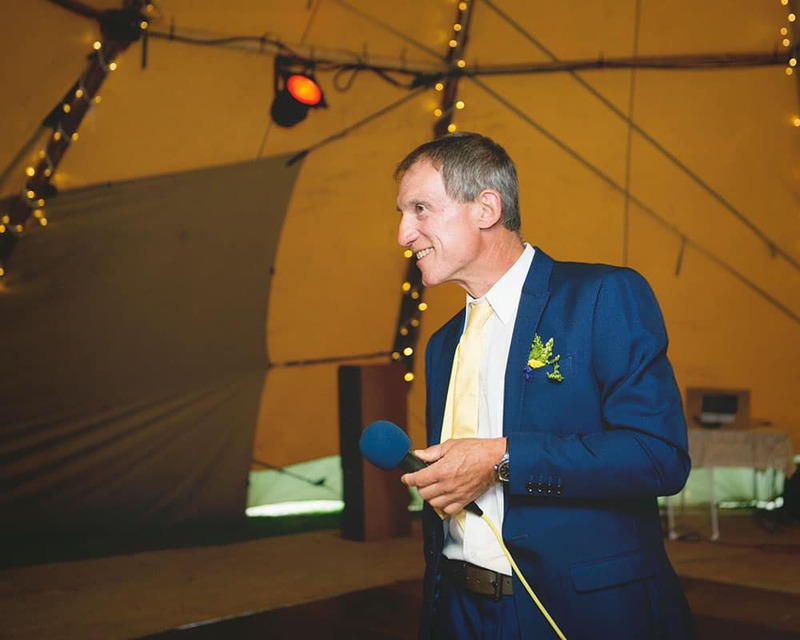 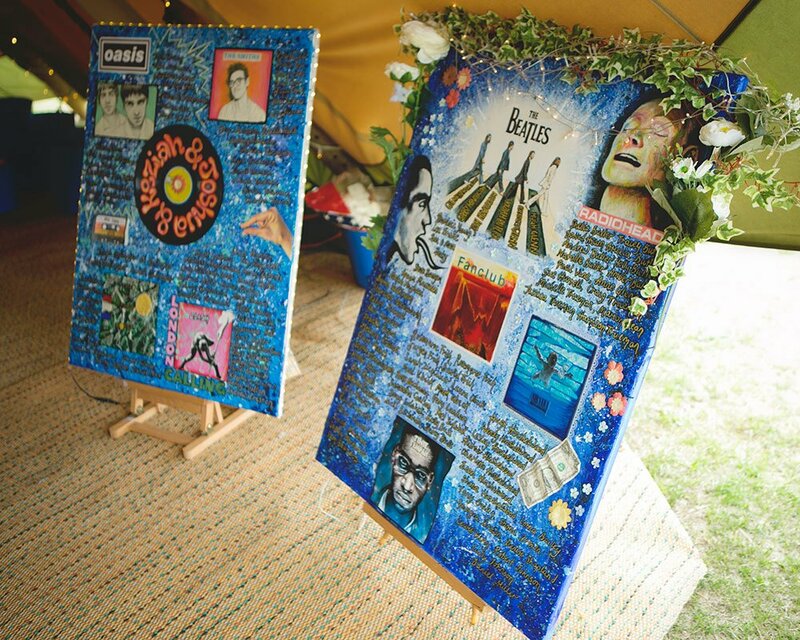 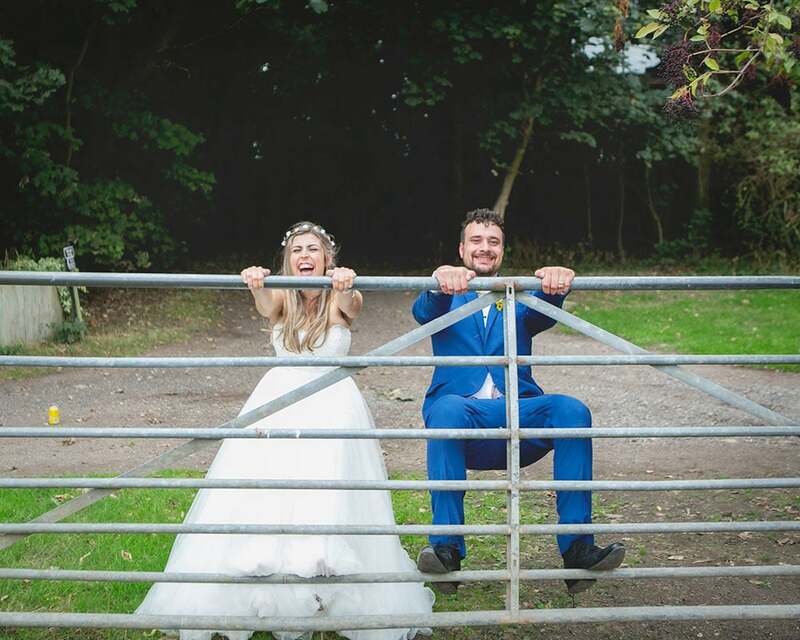 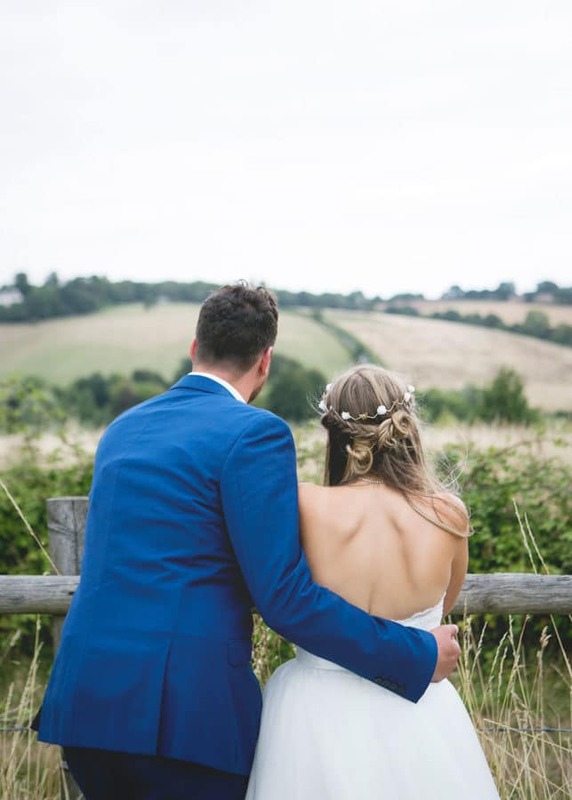 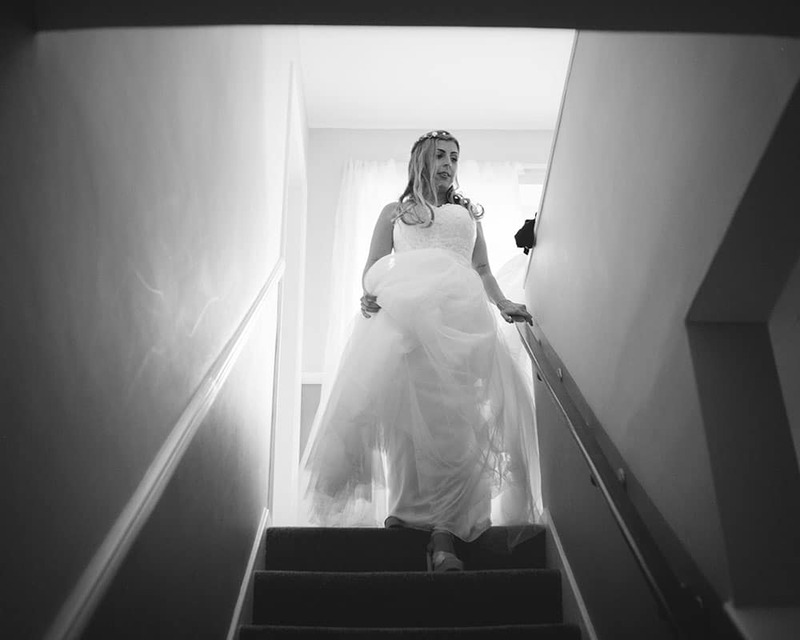 North Hill Farm is the ultimate in relaxed and festival style wedding venues. 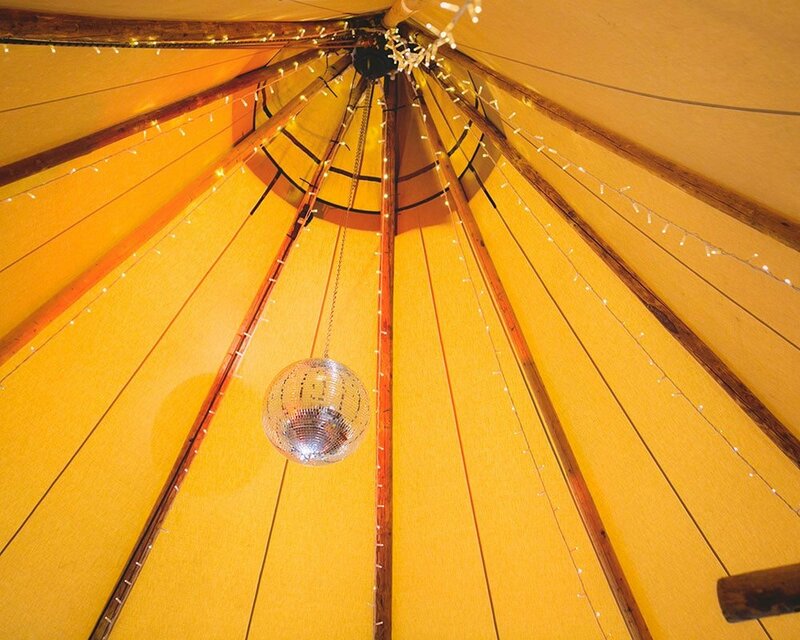 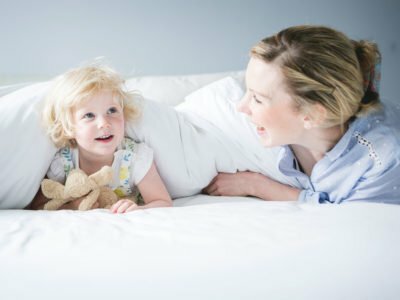 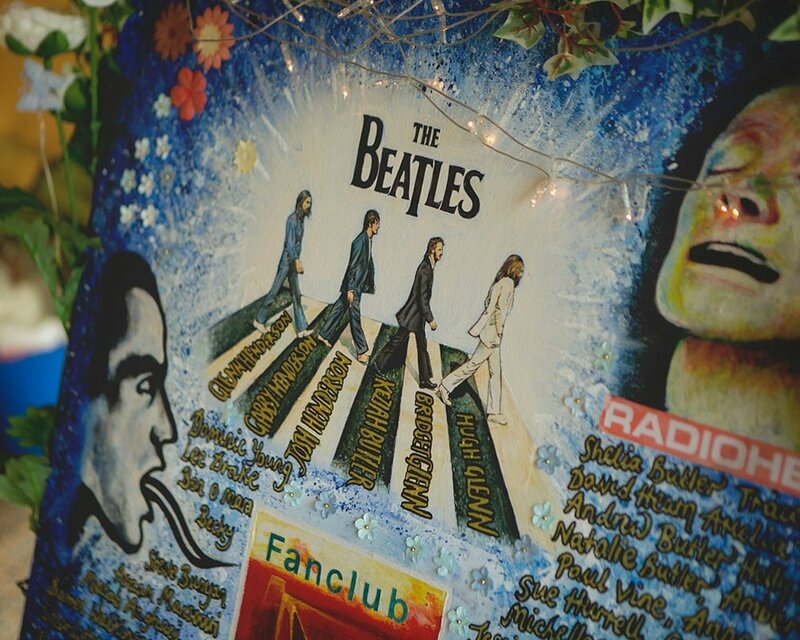 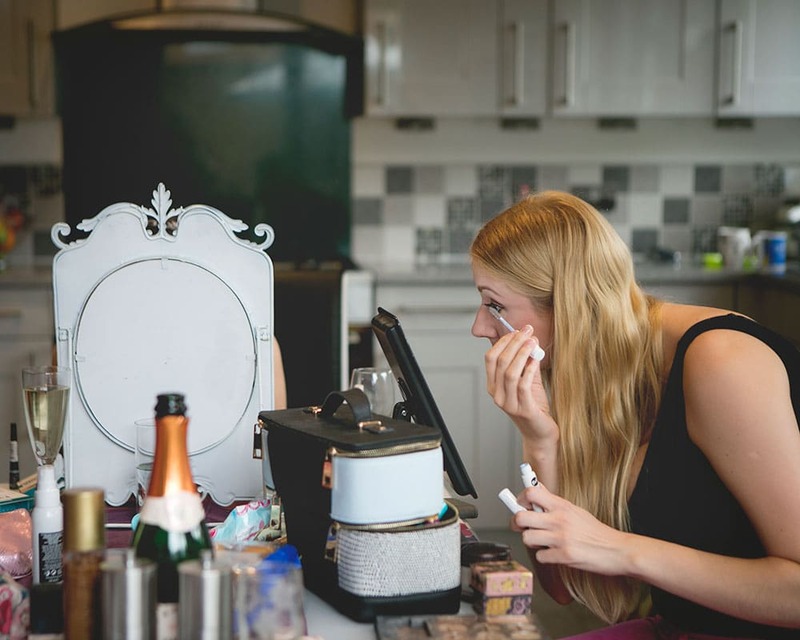 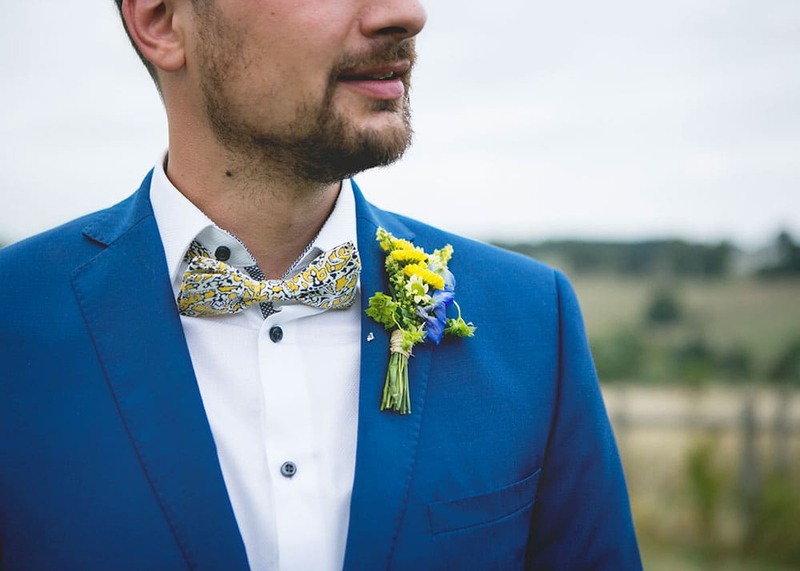 The venue has a small B&B on site that is available to guests, alternatively they also offer the option to camp on site so the party can go on all night. 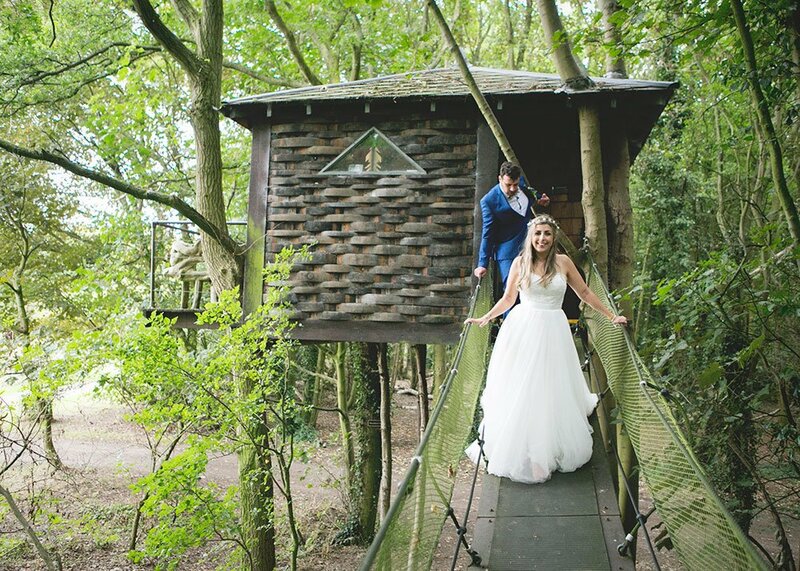 My favourite thing about North Hill Farm is the tree house accommodation! 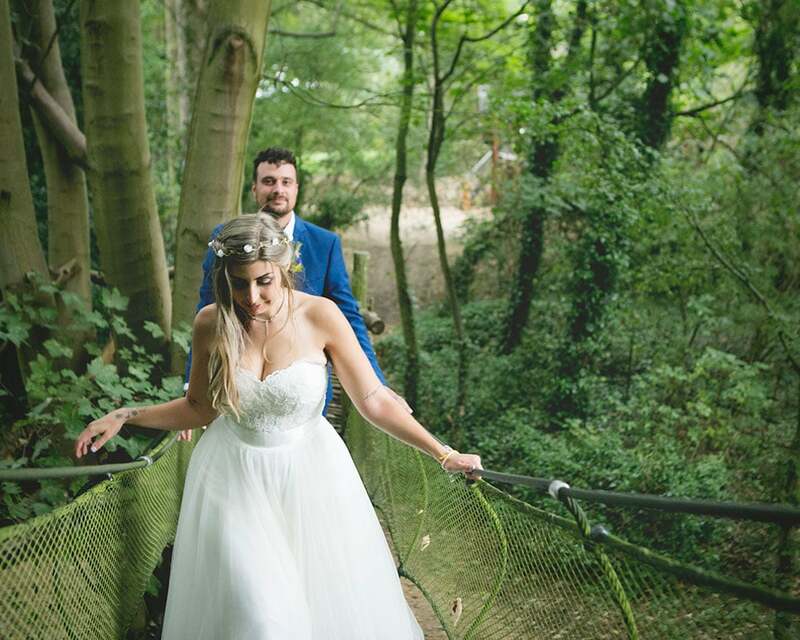 Yes I said treehouse. 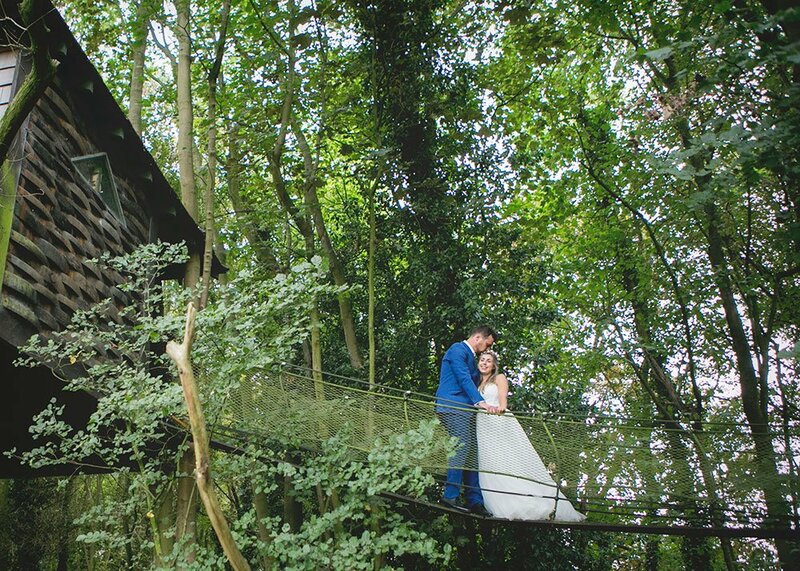 They have 3 incredible and very unique tree houses available to the couple and their guests. 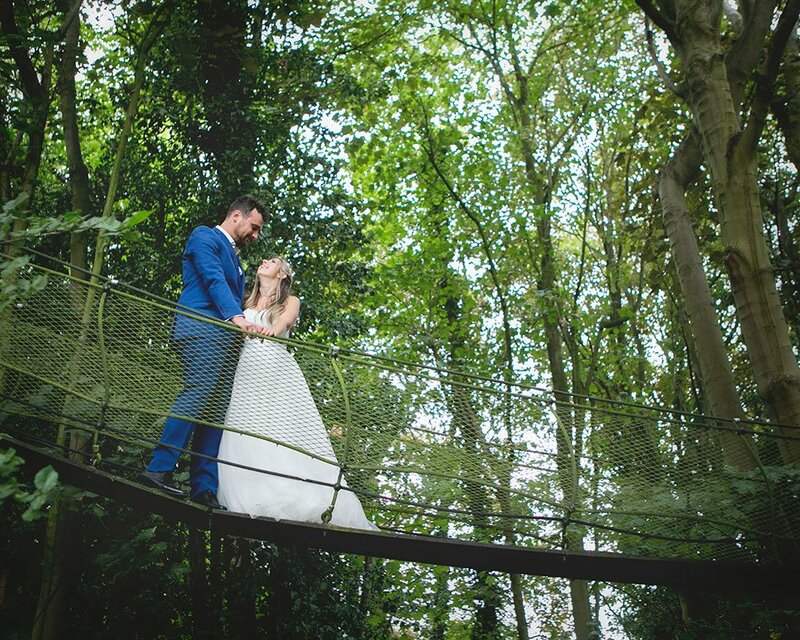 Josh & Keziah stayed in the Squirrel Run treehouse which we made great use of for some couple shots later in the day. 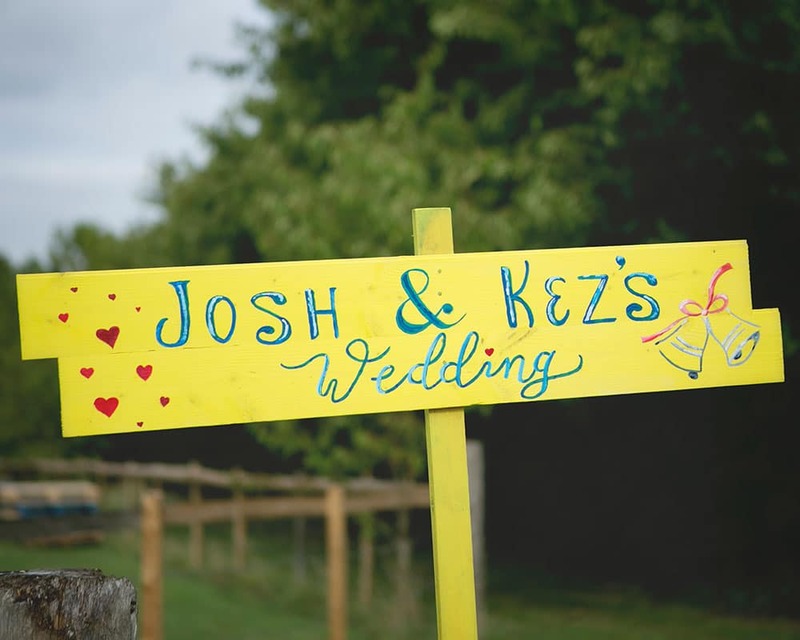 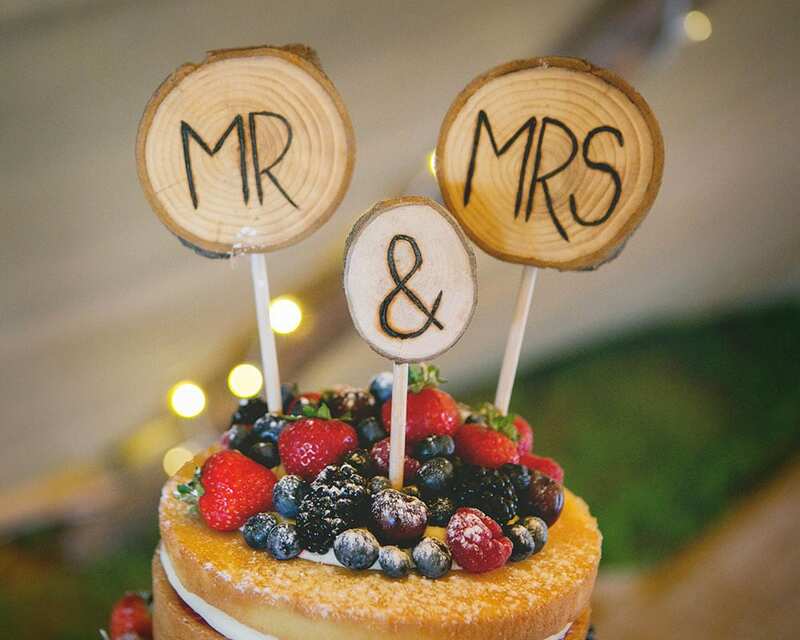 With friends and family lending a hand Josh & Keziah created a great DIY reception. 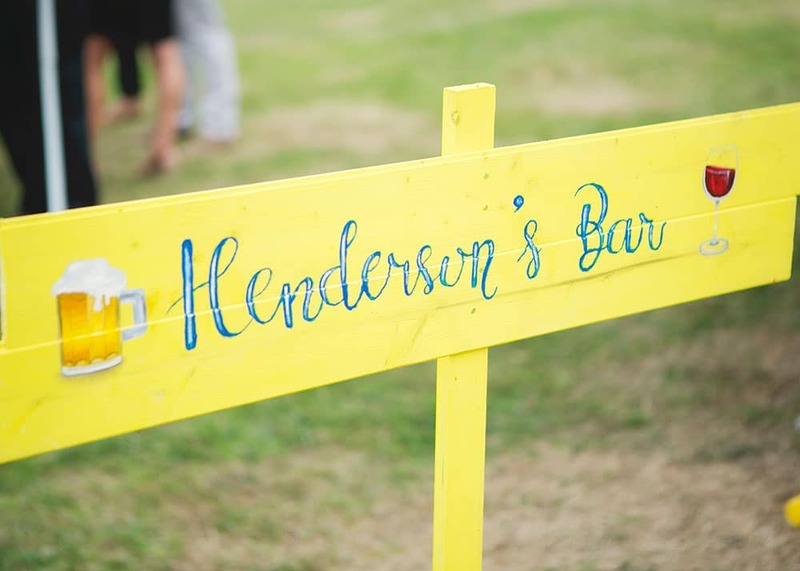 They put up their own bar with plenty of booze supplied, painted some awesome festive style signs to guide guests to the party and decorated the Tipi themselves. 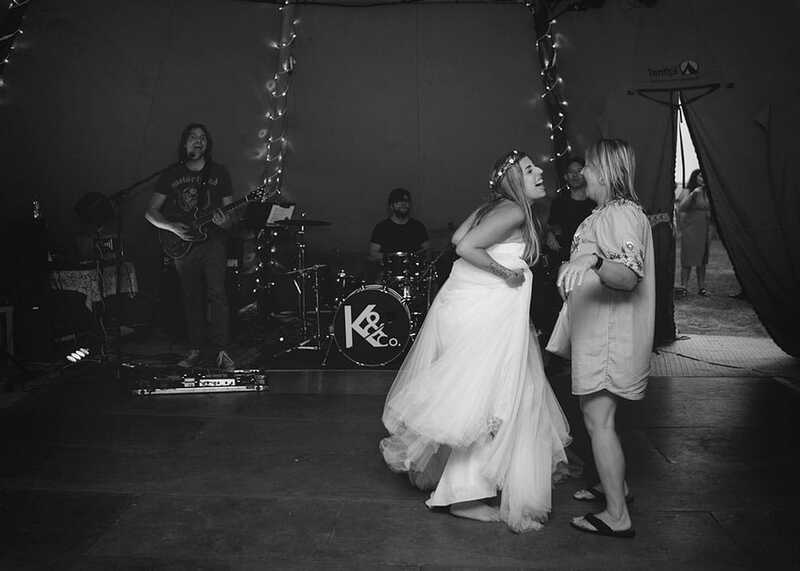 As the sun set and the band was in full swing a bonfire was lit. 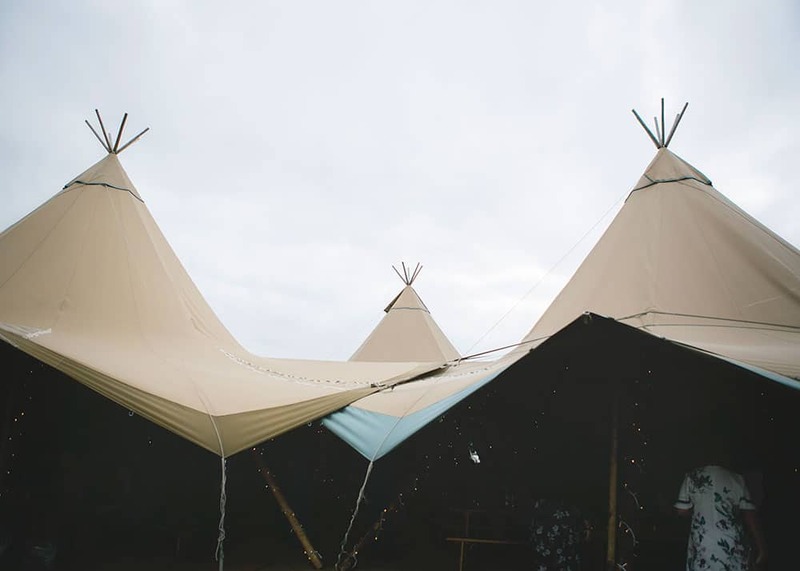 A summer evening bonfire next to a tipi party, is there a better way to spend your first evening as husband and wife?